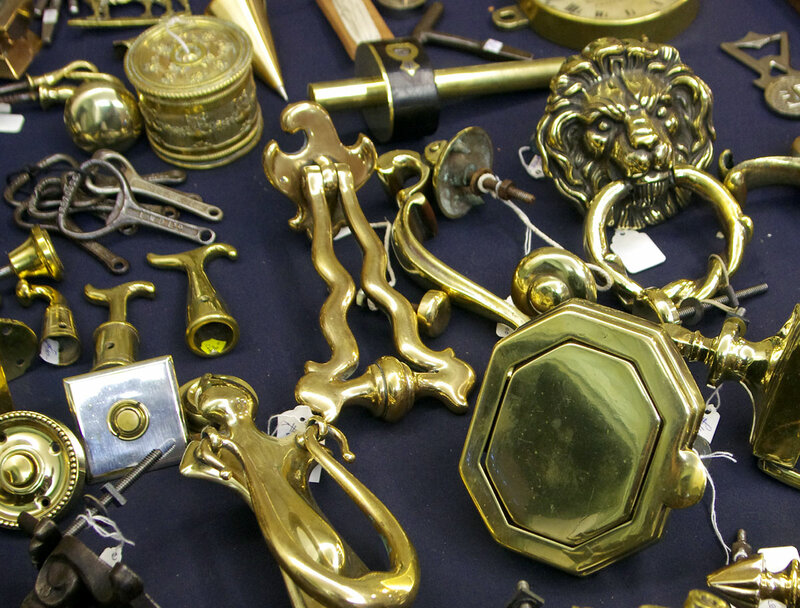 This will be the last time we feature our dealers in this format, as we're gearing up towards an all-new website before the next fair in November 2019. 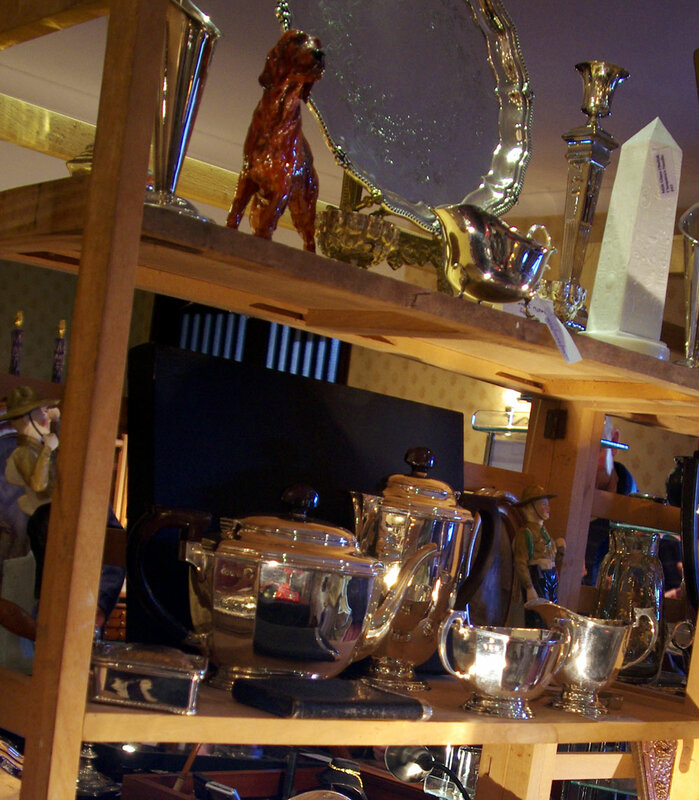 For March this year we have updated the current format as best we can, but we're really looking forward to the new site, and an easier way of displaying details and photos of our dealer's stock! 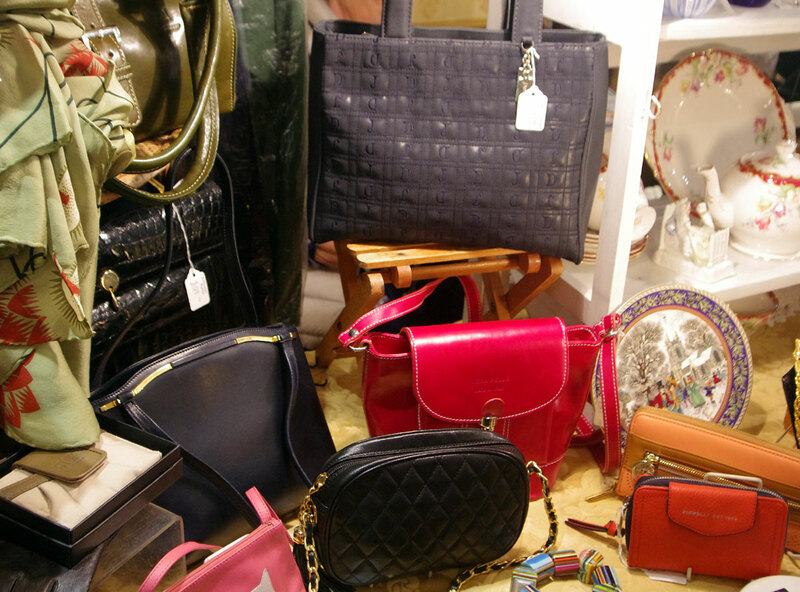 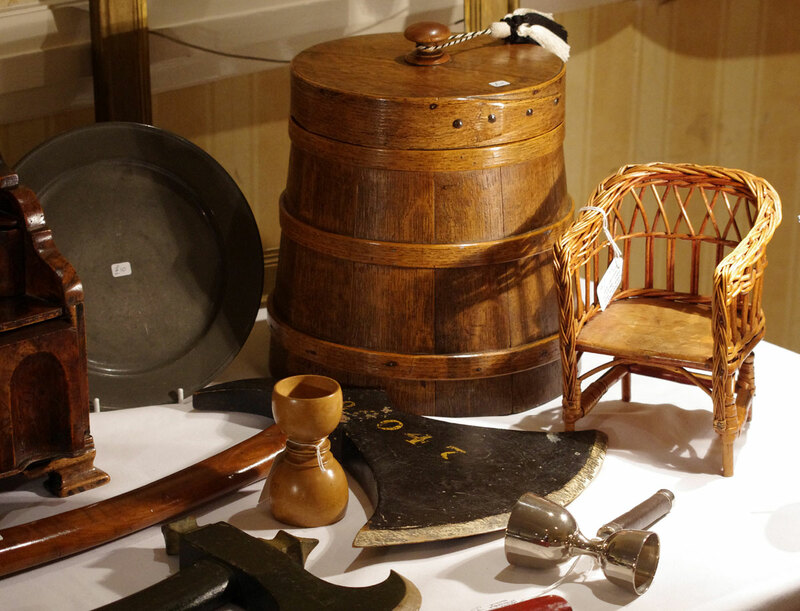 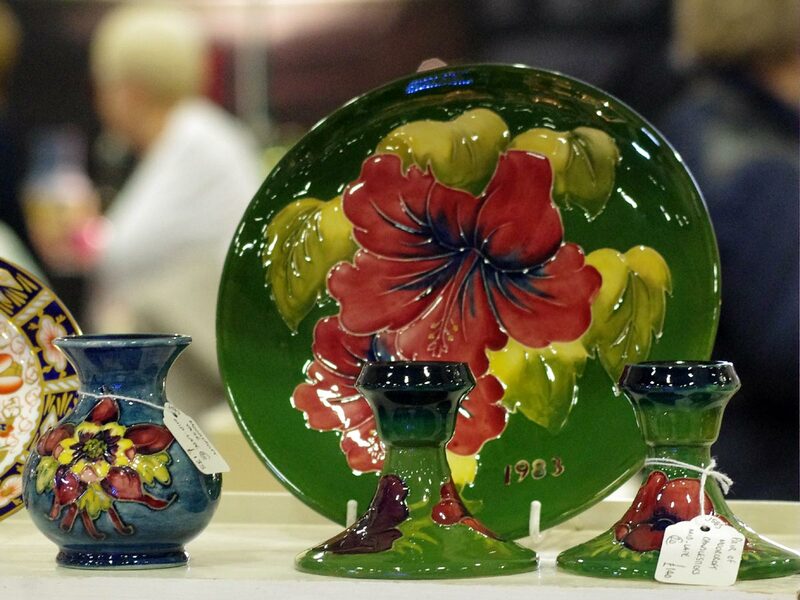 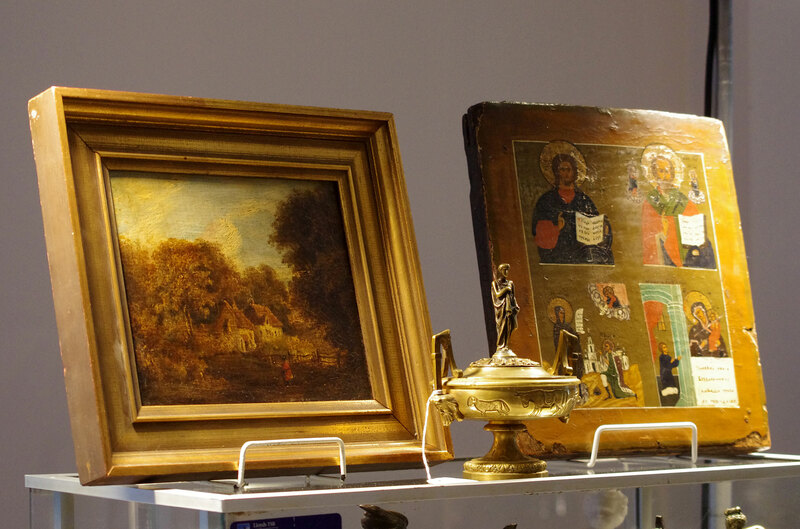 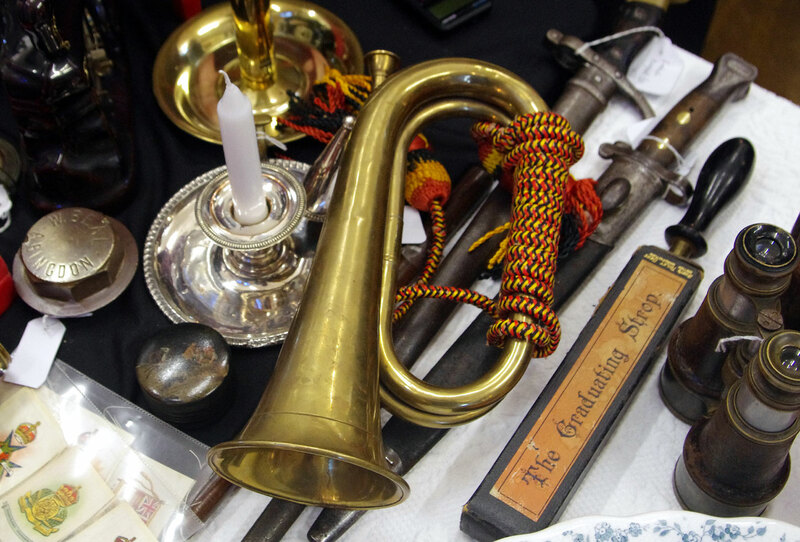 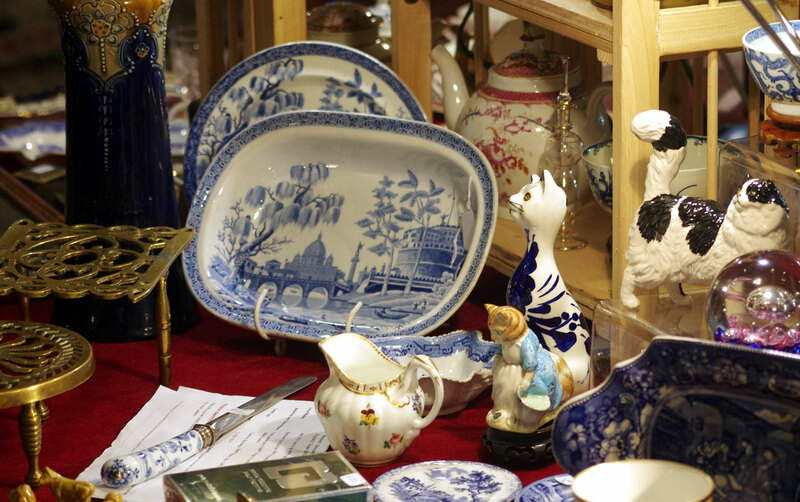 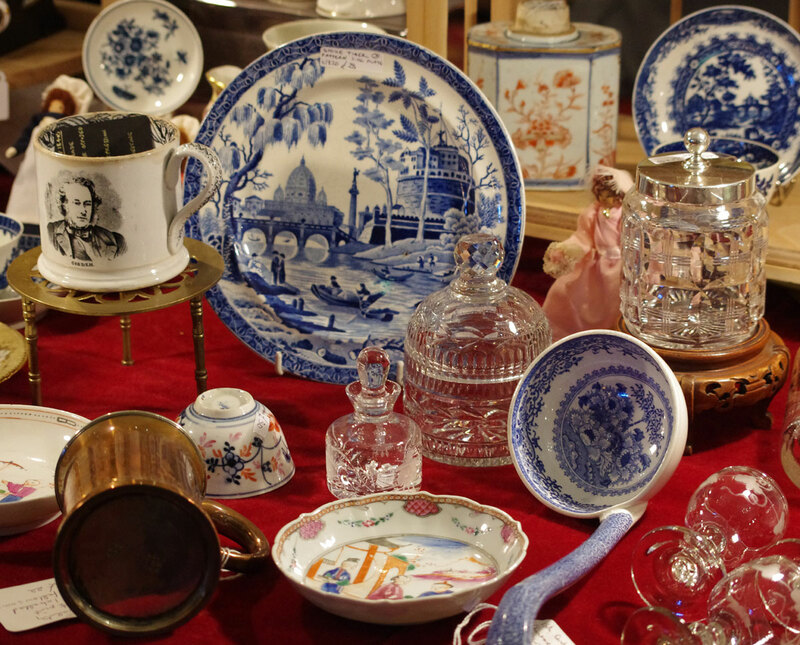 This page can act as as an introduction to just some of the dealers who will be attending our Spring fair, and includes images of typical items from their stock. 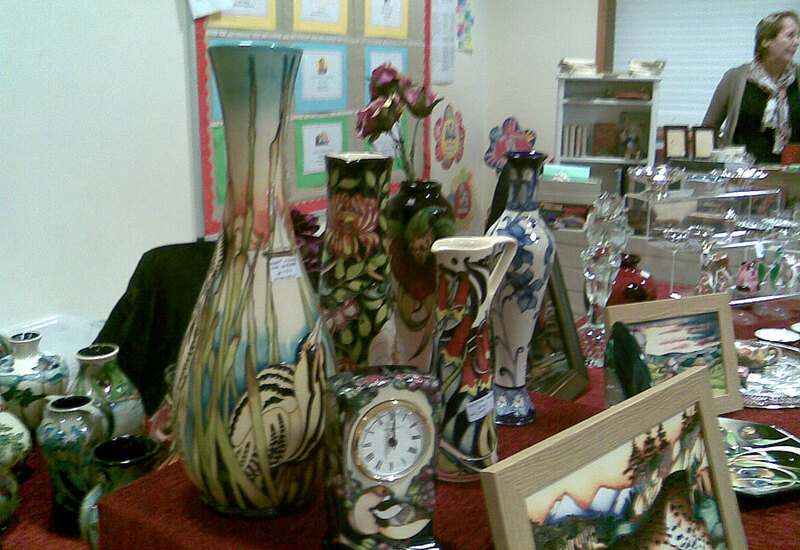 Click on the thumbnails to view enlargements. 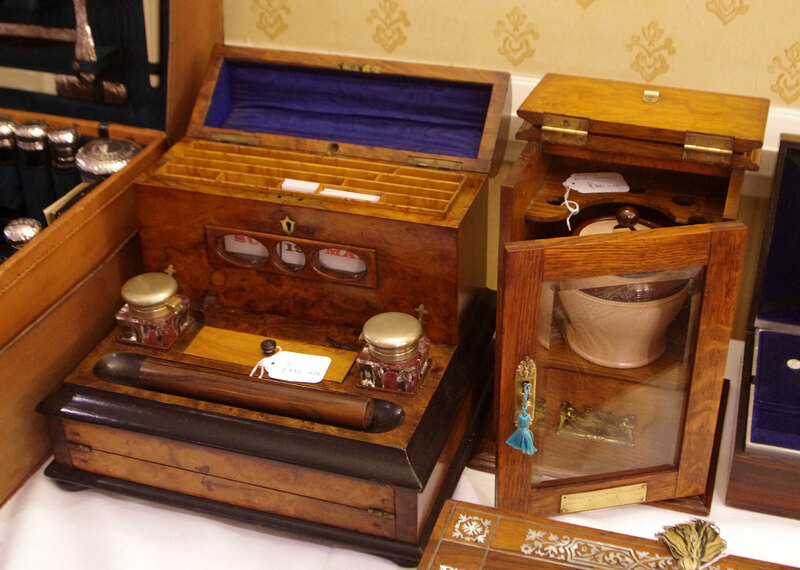 If you are a dealer, and would like to know more about booking a table for future events, please Contact us, and we will send you the appropriate information. 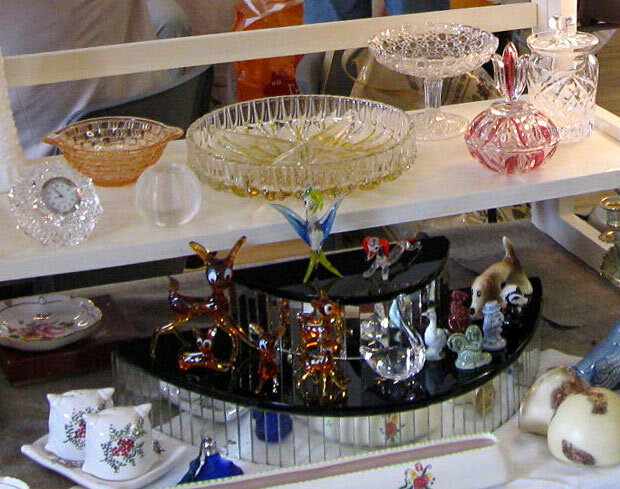 Other dealers present in March include: George & Dianne Starbuck, Ros McCarthy, David & Rose Johnson, Peter Stevens, Stephen Yorks, Paul Baker, Brenda Haller, Annie Gowler, Jodie Houghton, Sue West, Brian Jeffels, Françoise Daniel, Michelle & John Lander, Stephen Walters, Diana Marcovitch, Tony Sussman and Old School Antiques. 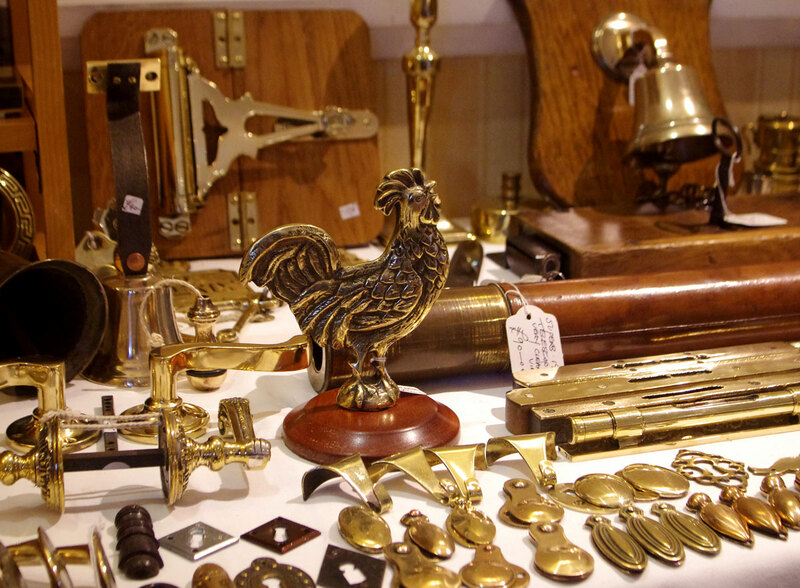 Andrew Long continues to be a stalwart supporter of Antiques@TheHolt, and has yet to miss a single fair in over five years. 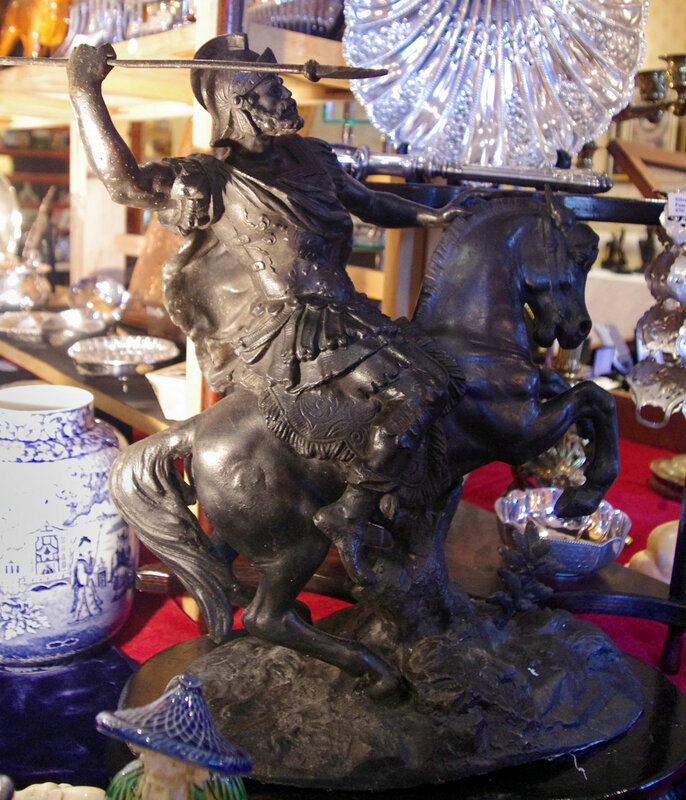 His stock is genuinely eclectic, and includes all manner of items, from his favourite Charlotte Rhead and other early C20th ceramics, to choice examples of glassware, toys and games, and almost inevitably, a few items of militaria. 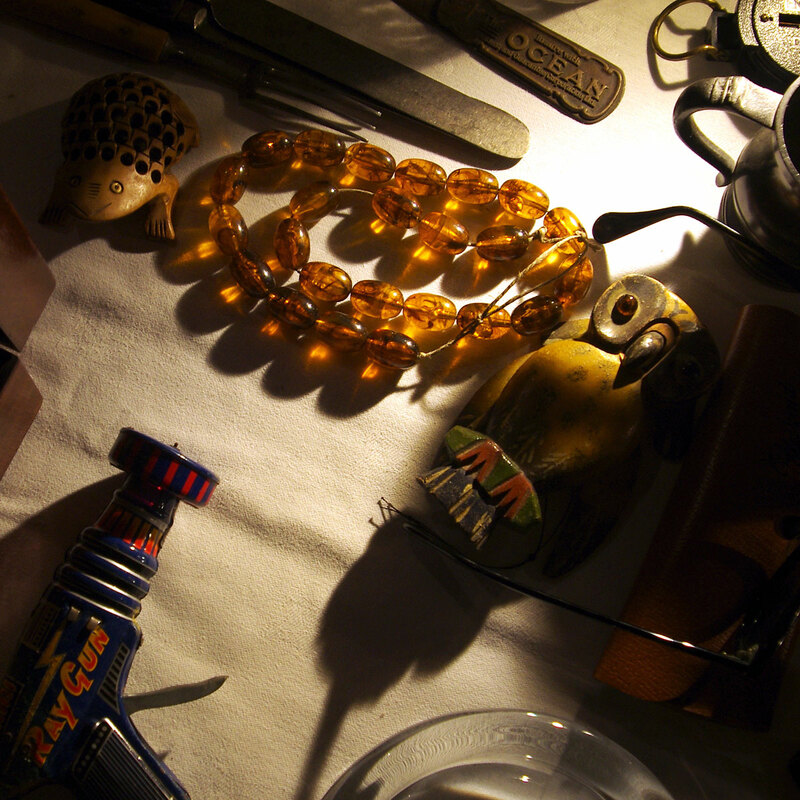 Andrew can be contacted through this website. 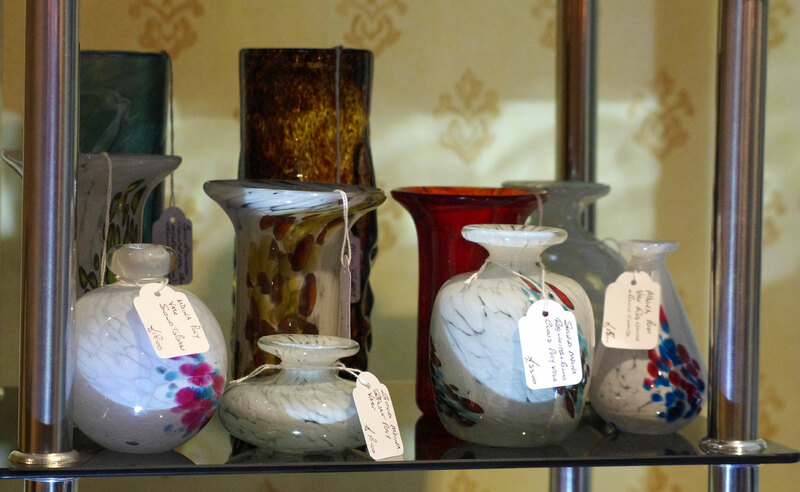 Few are likely to forget their first sight of Ron and Ann's display of glass. 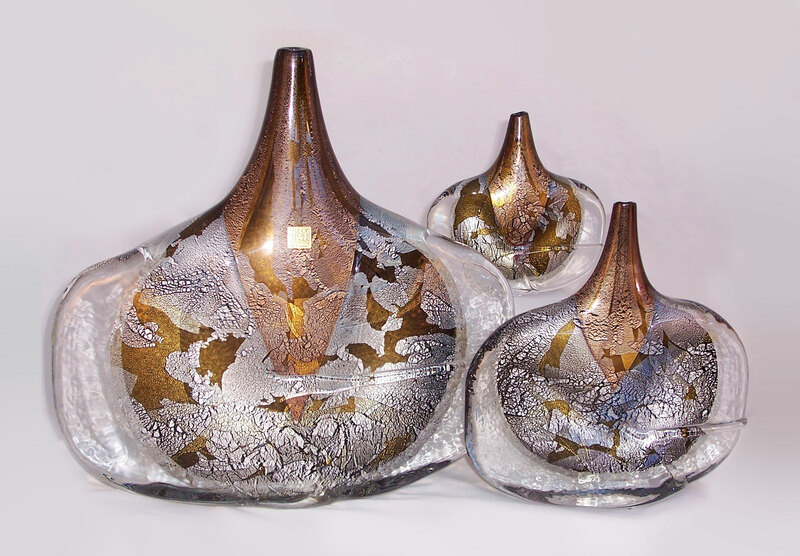 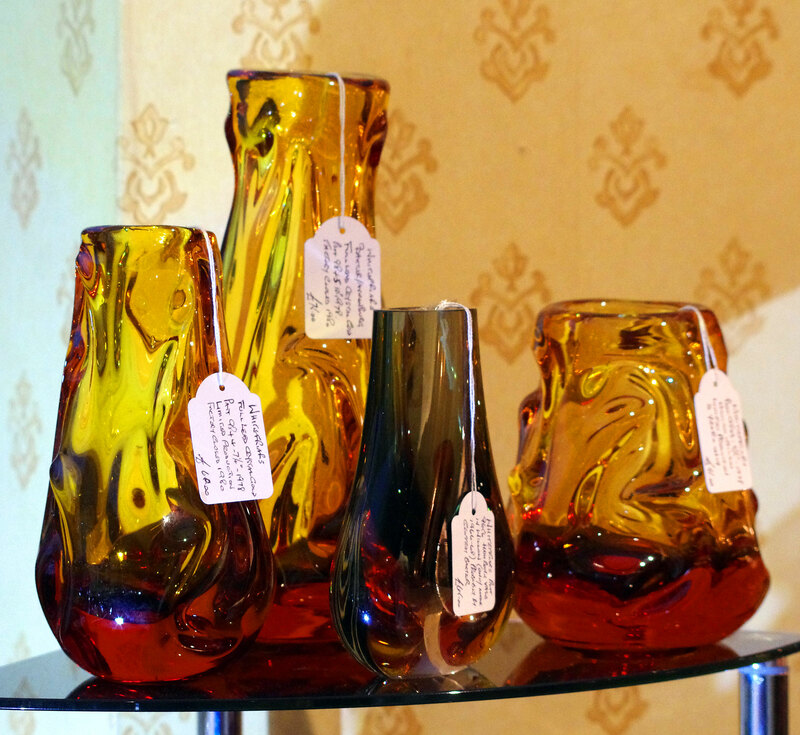 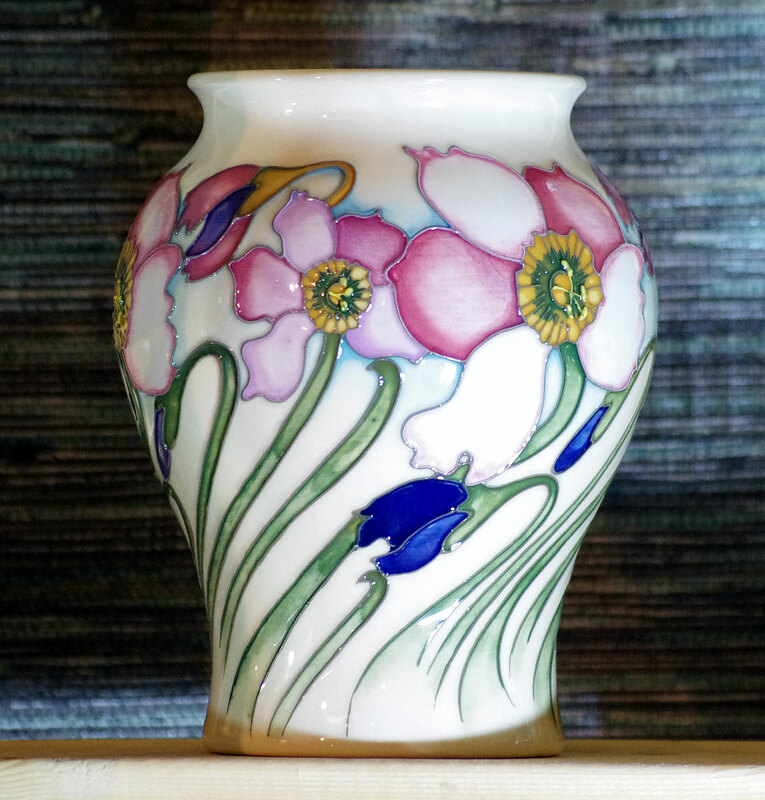 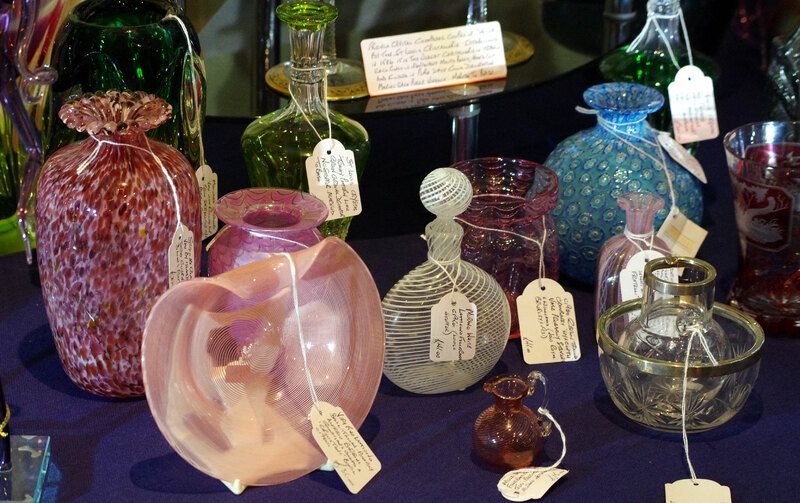 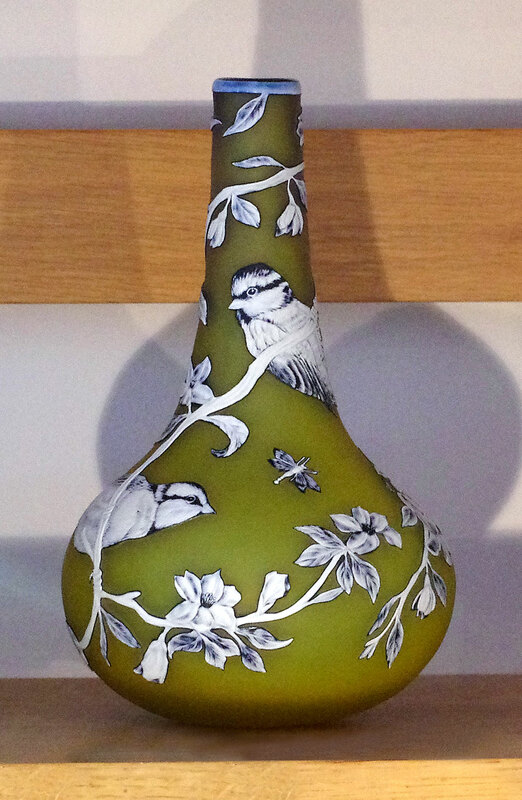 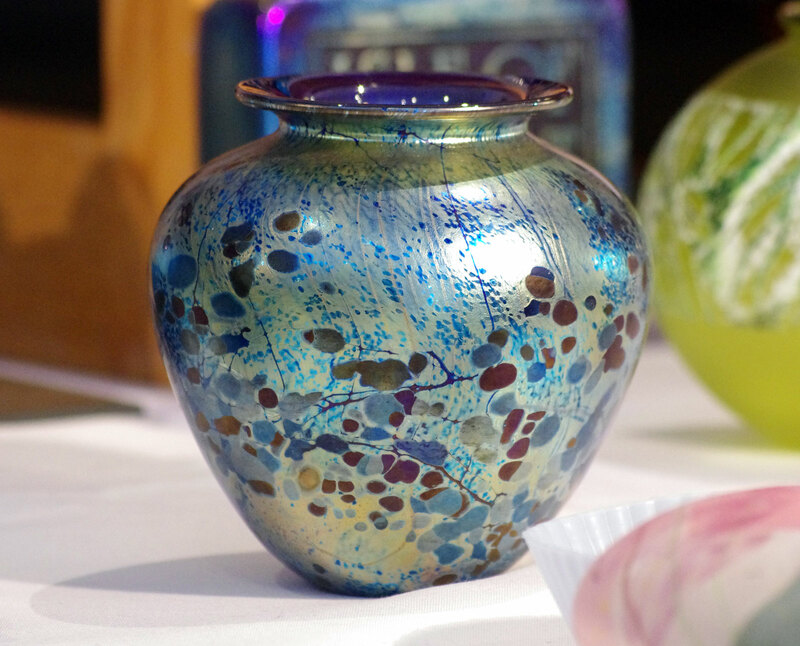 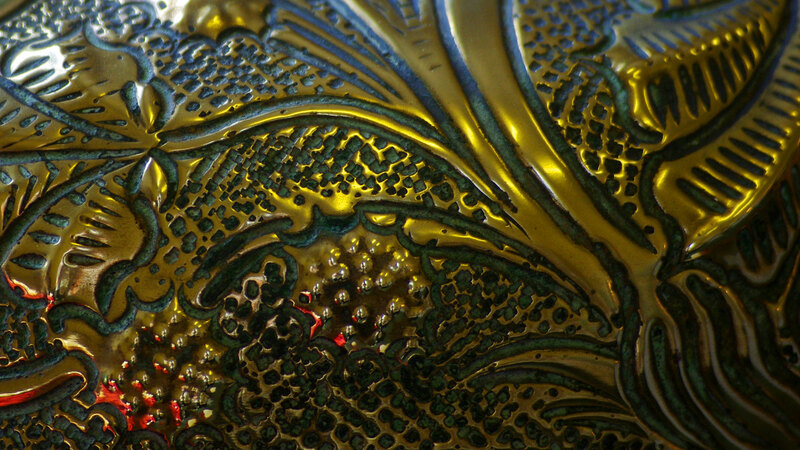 Stunningly beautiful examples of the finest British glassmaking from the last century. 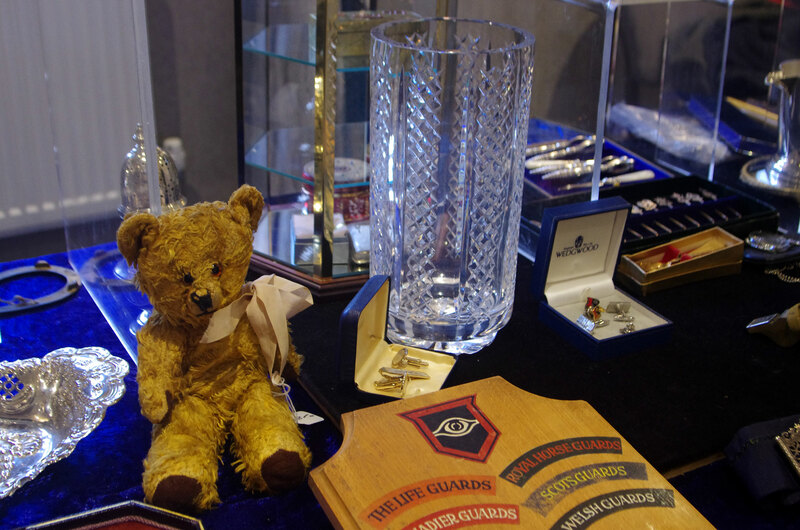 Ron's knowledge of Isle of Wight studios is second to none, with particular expertise on the works of founder Michael Harris, as well as sons Timothy & Jonathan. 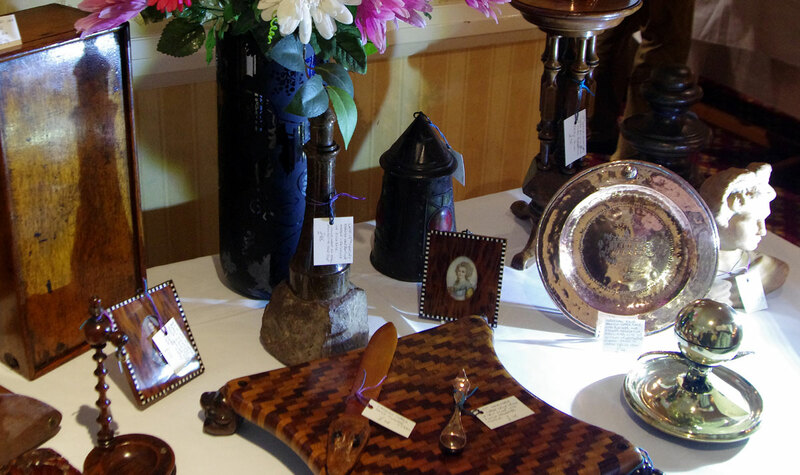 Also look out for Okra, Michael Hunter, Jenny Blair & Mdina. 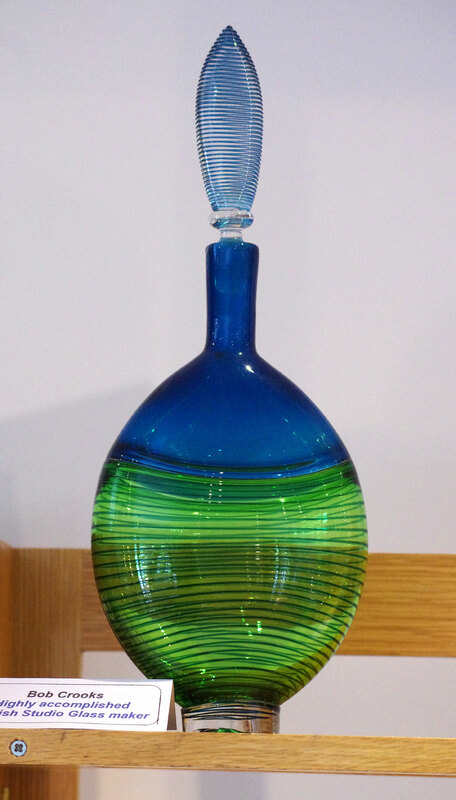 Ron & Ann can be contacted through their website: Artius Glass. 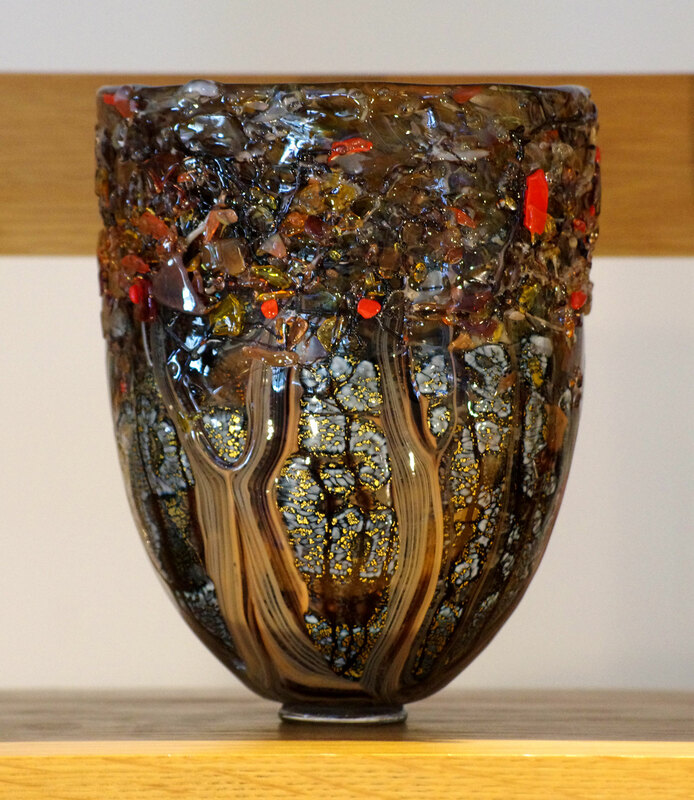 Graham has stood at The Holt several times now, and always impresses with the scale of his pieces. 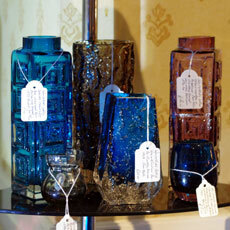 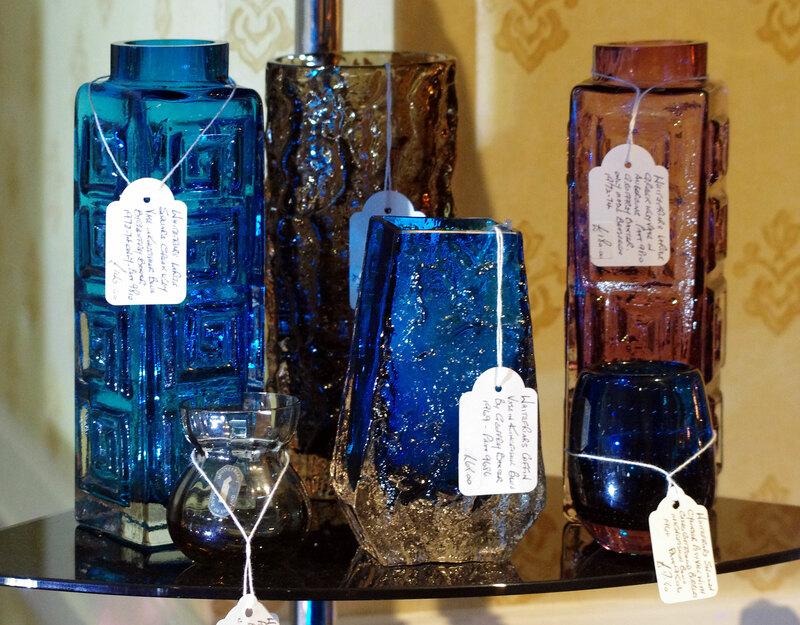 Mostly 20th century art glass, he favours British designers, and has a soft spot for Whitefriars. 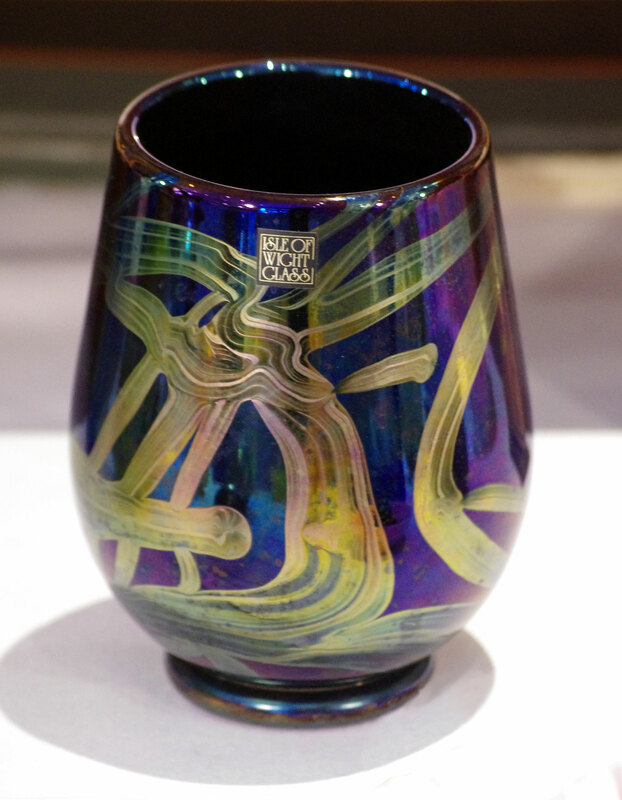 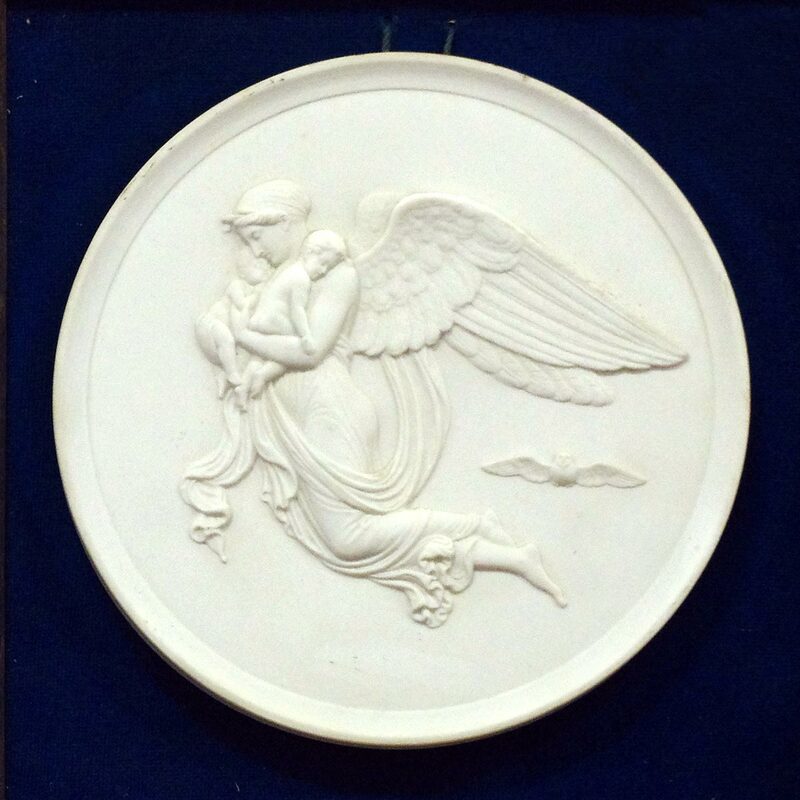 However, he usually finds space for some Mdina, or Venetian pieces, and has promised to bring along several examples of Lalique for the Holt this March. 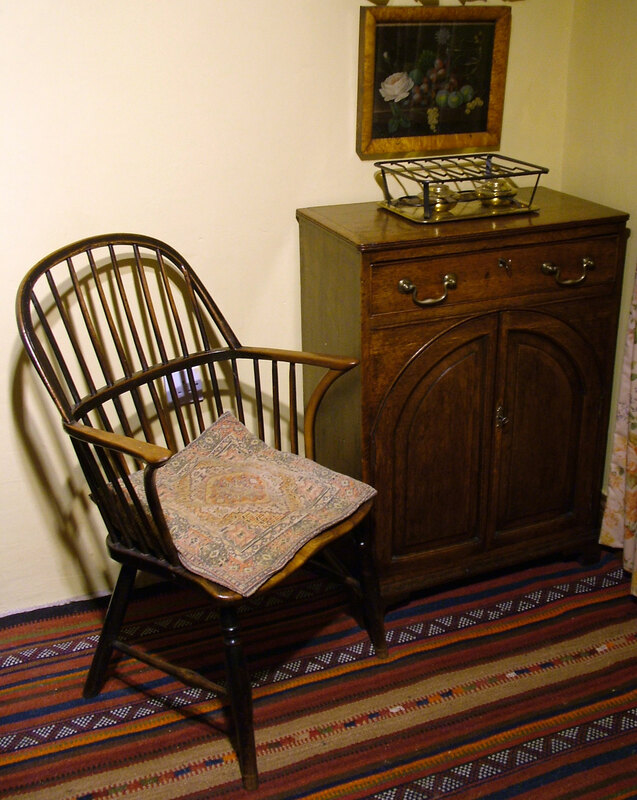 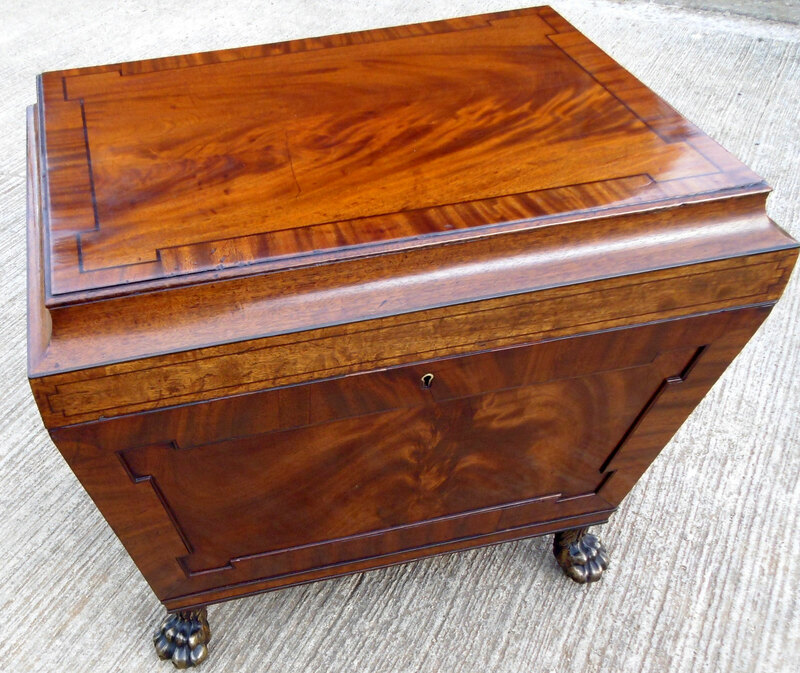 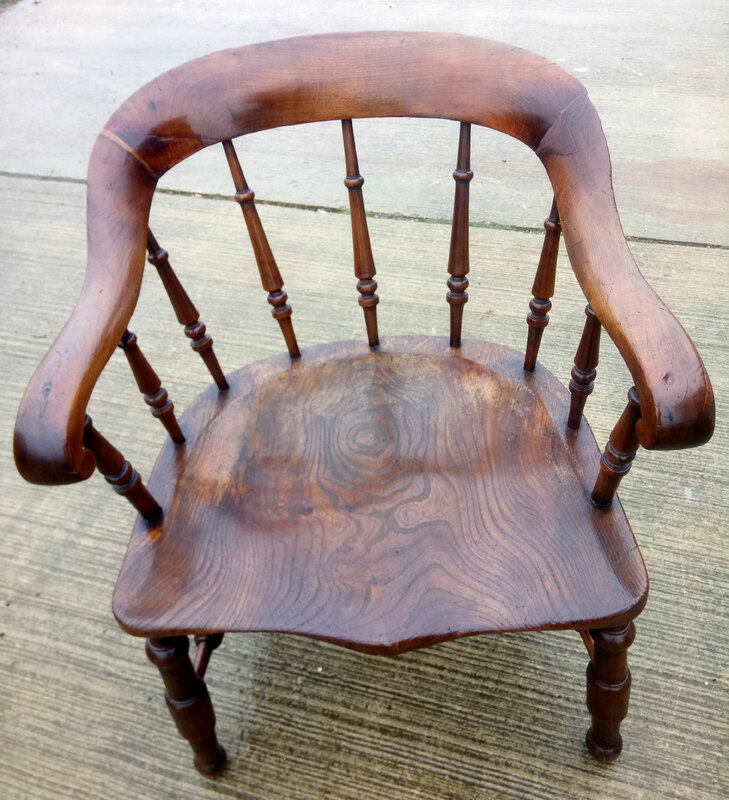 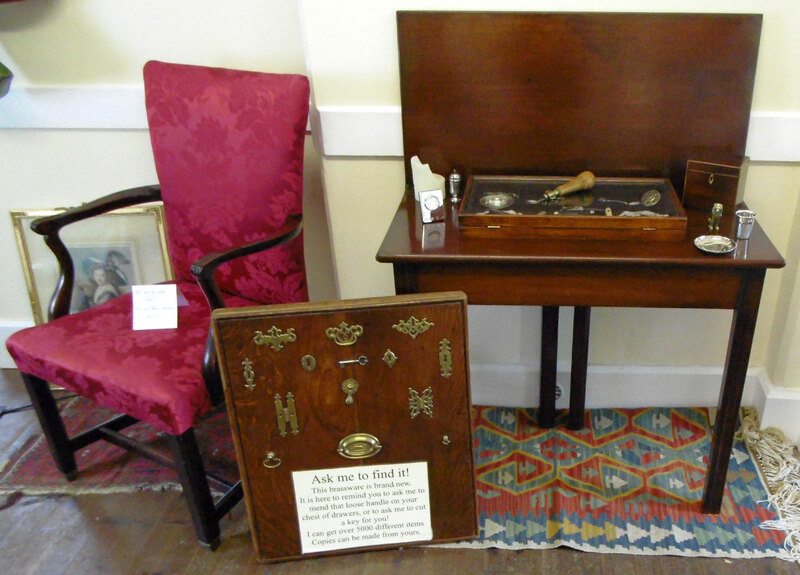 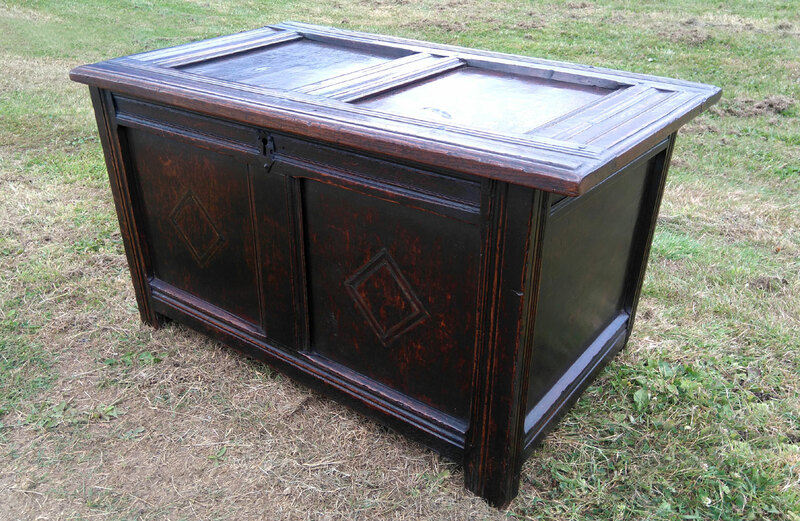 Andy has been restoring furniture for nearly 25 years now and will have several examples of his work on display at The Holt, including an Oak cabinet and a Windsor Chair. Other items he has promised to bring include an oak brass-dial longcase clock, some other traditional chairs, a few wine tables, pictures and some brass furniture fittings. 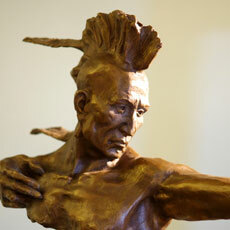 Follow Andy on Twitter, or visit his website. 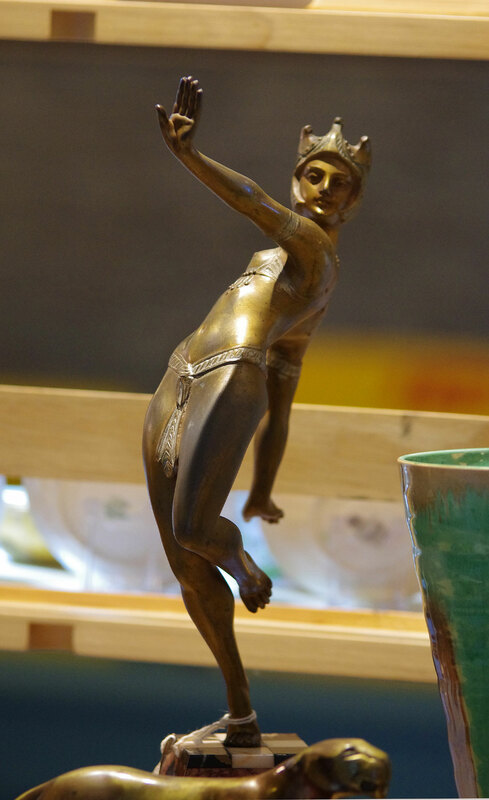 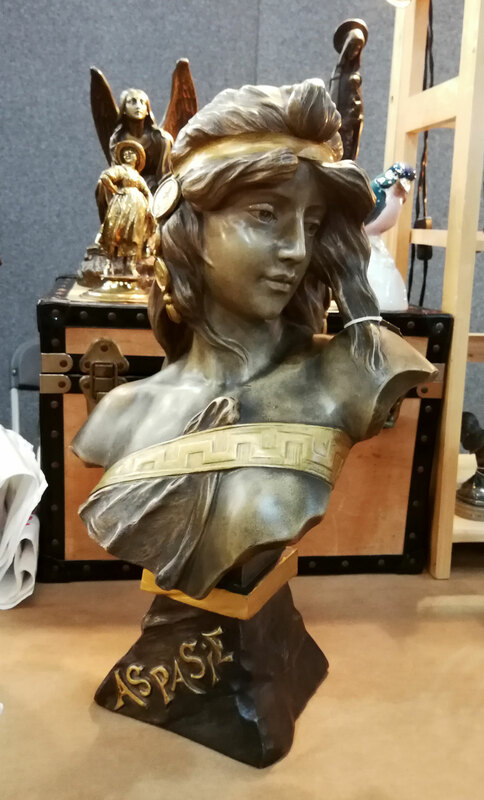 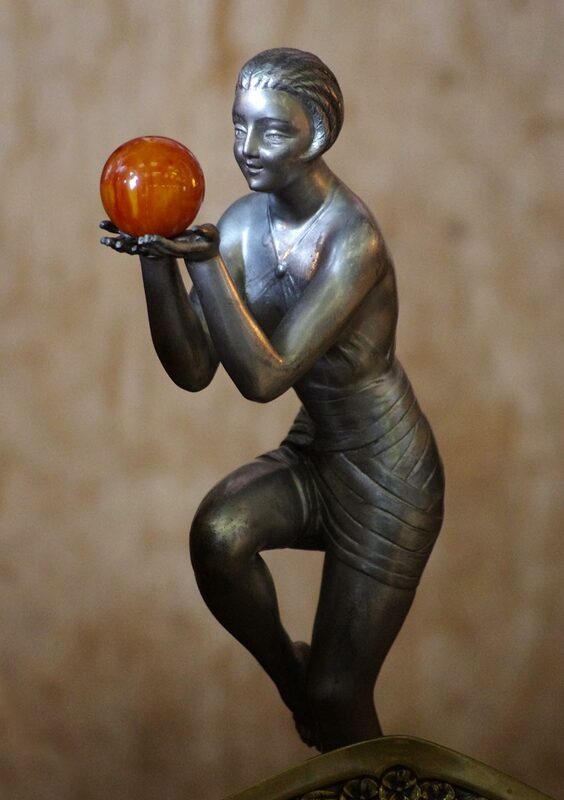 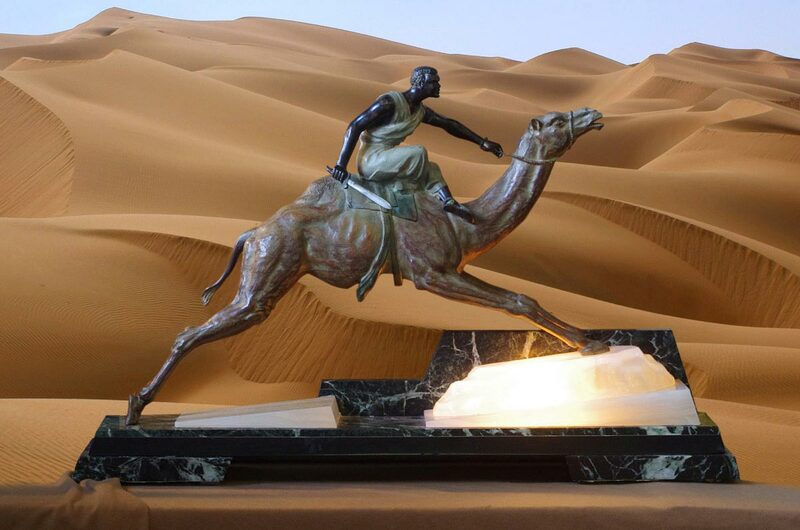 Anyone who has a passion for the elegance and beauty of the classic Art Deco bronze will instantly appreciate the quality Mark's stock. 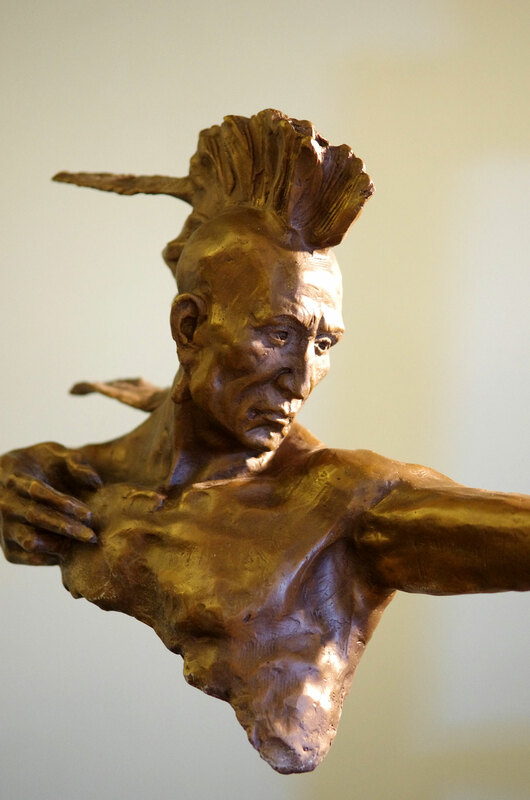 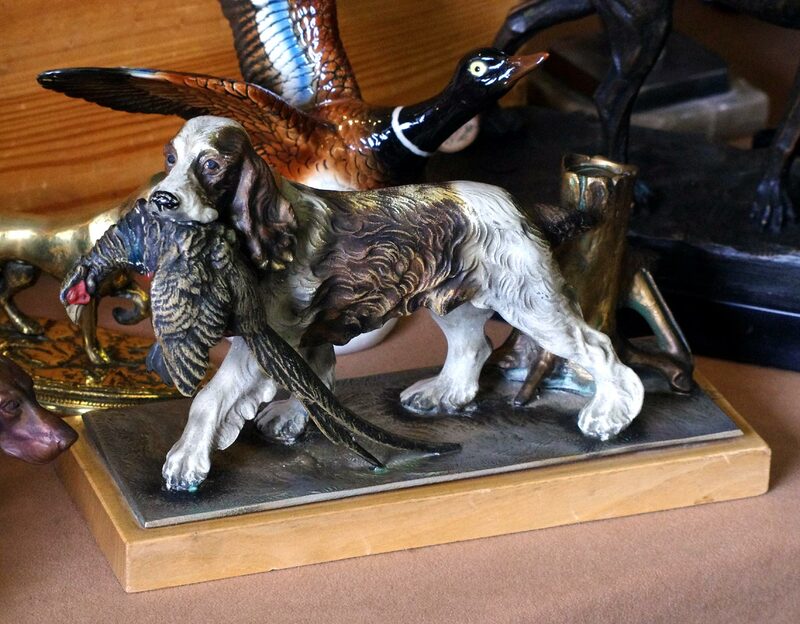 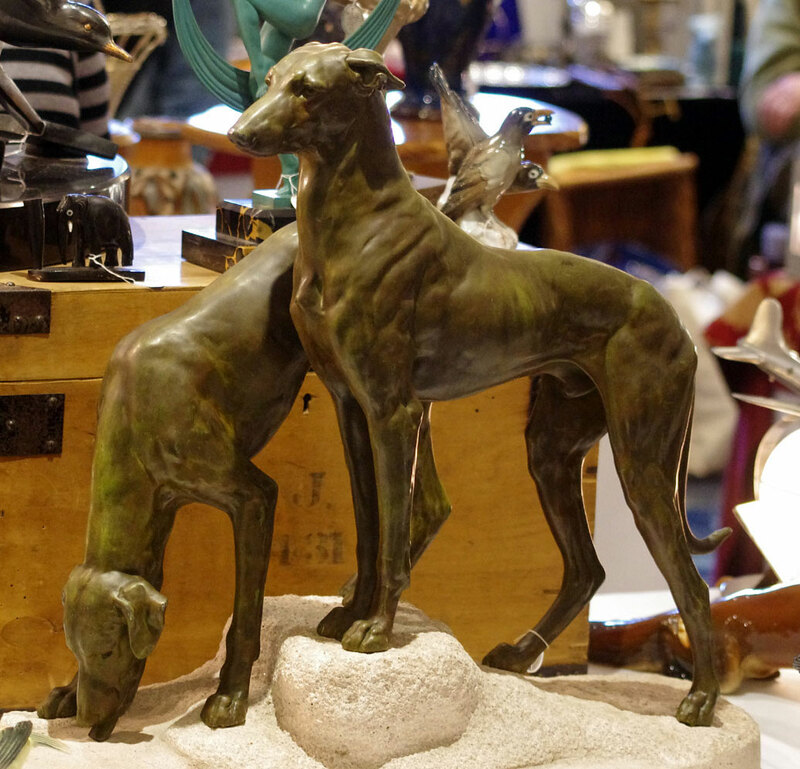 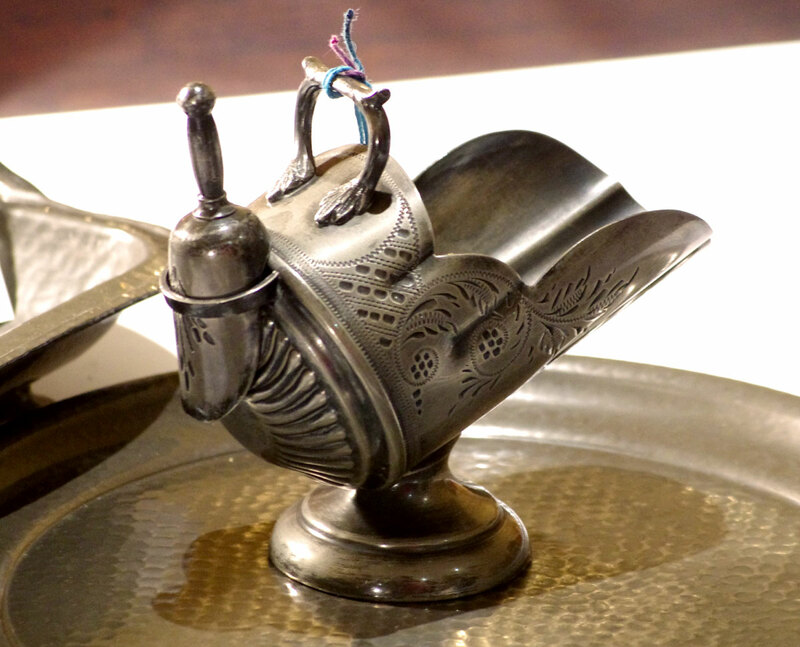 His stand includes a vast array of genuine period pieces - with flappers, dancers and beautiful nudes supplemented by bronzes of dogs and other animals, as well as choice ceramics from the likes of Wallendorf, Katzhutte, Goldscheider and Hutschenreuther. 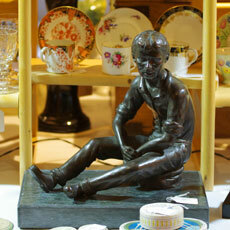 Mark attends most major fairs, and can be contacted through this website. 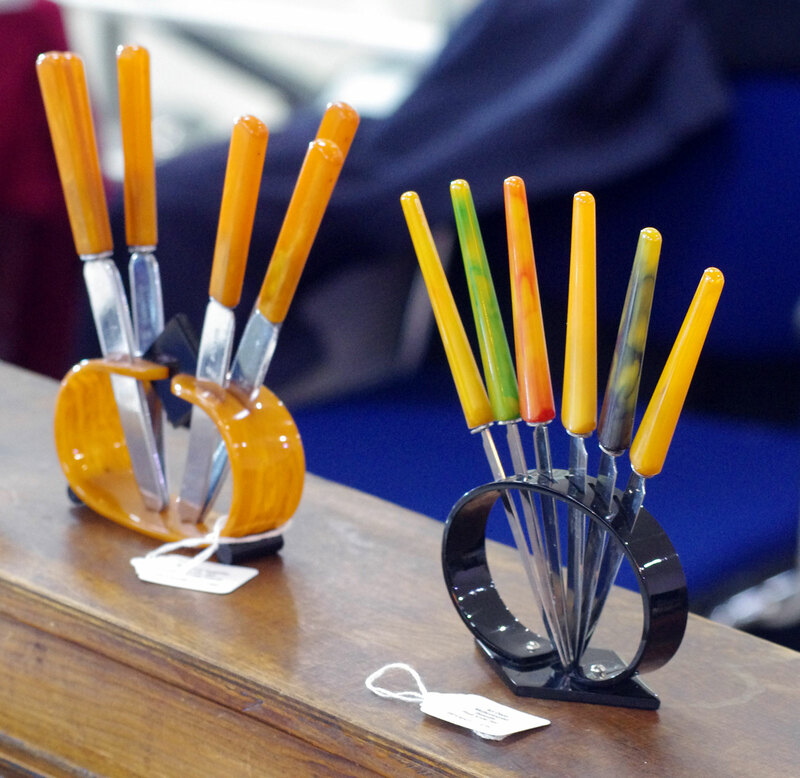 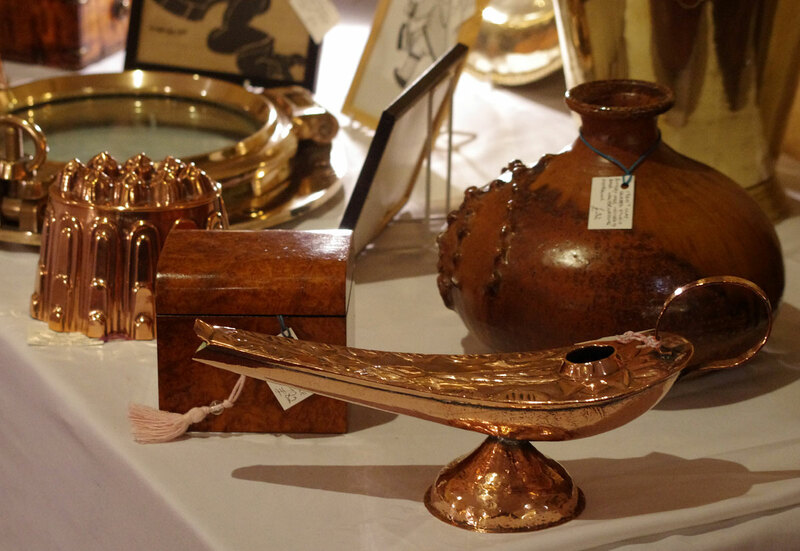 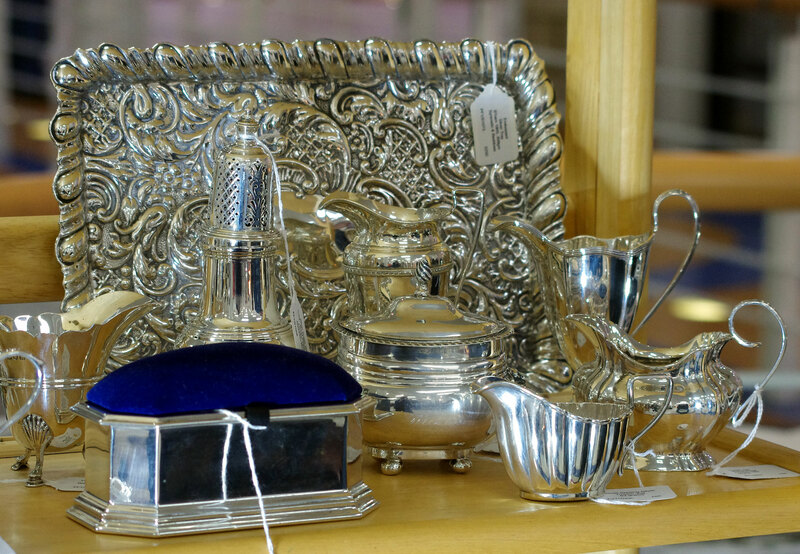 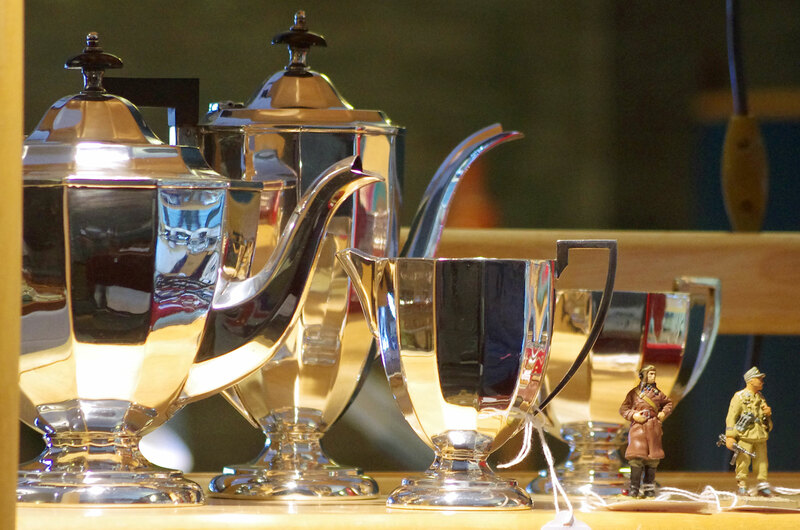 Brian and Pauline have become regulars at The Holt in recent years, and now occupy one of our larger stands where their array of stock, silverwares especially, make a significant visual impact. 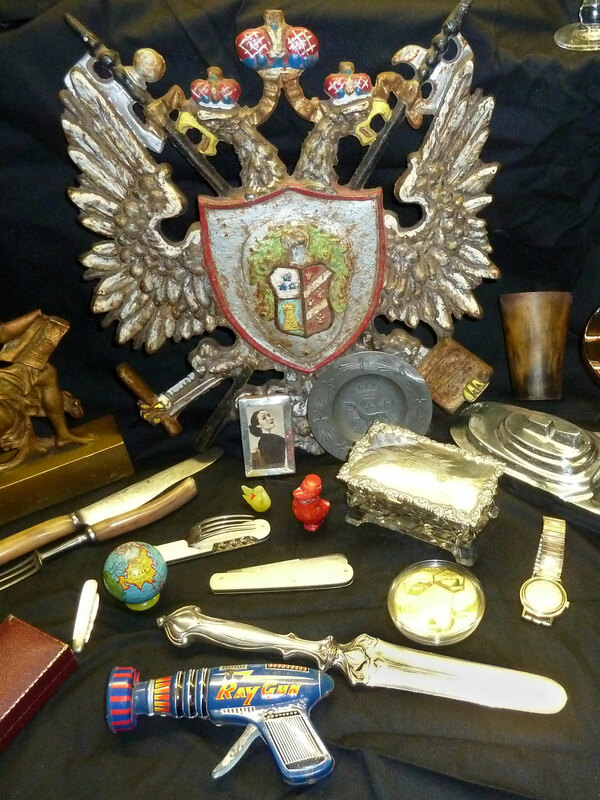 Always impeccably presented, they invariably find those quality pieces that are both desirable and unusual, such as the Guild Hall crests that they displayed in November last year. 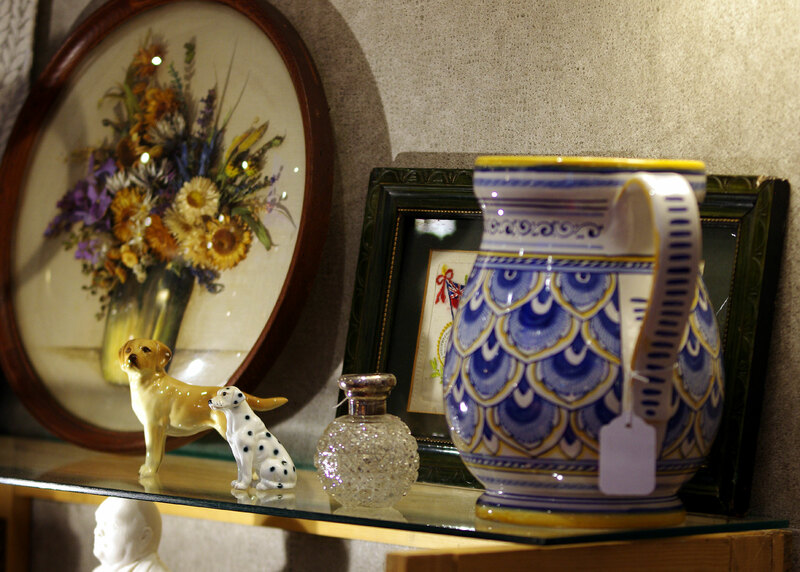 Brian and Pauline can be contacted through this website. 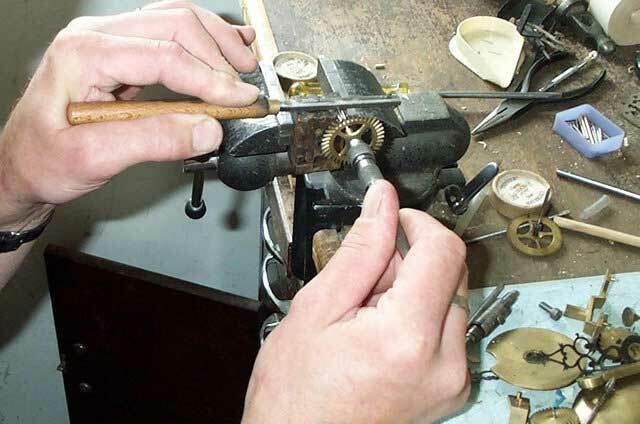 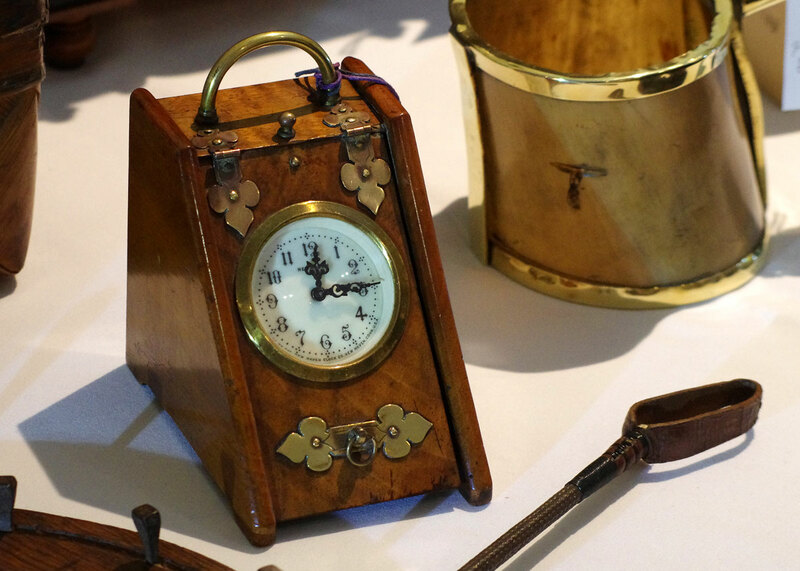 Based in the Cotswolds just west of Oxford, Andrew is one of the area's foremost repairers and restorers of antique clocks and timepieces. 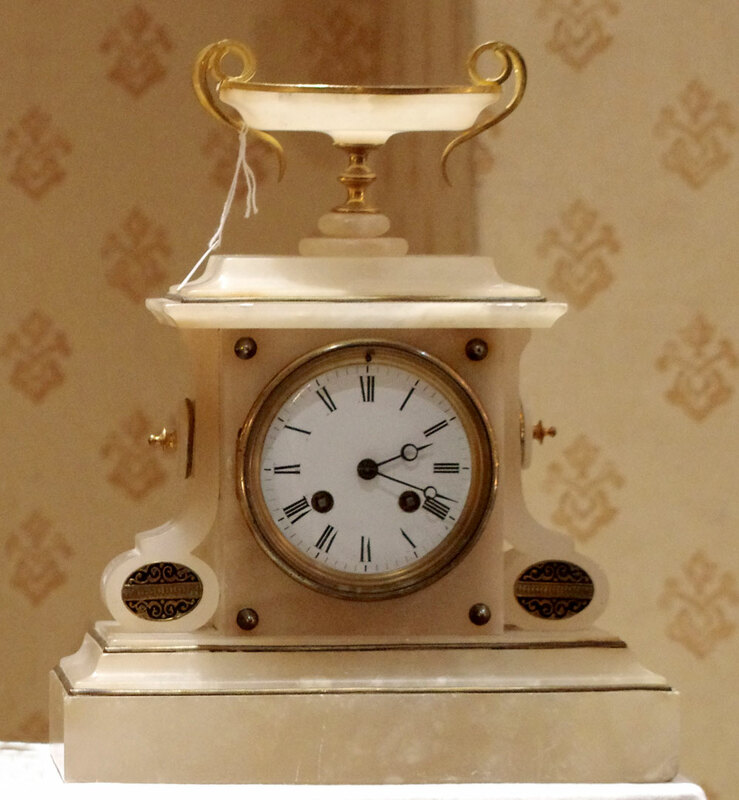 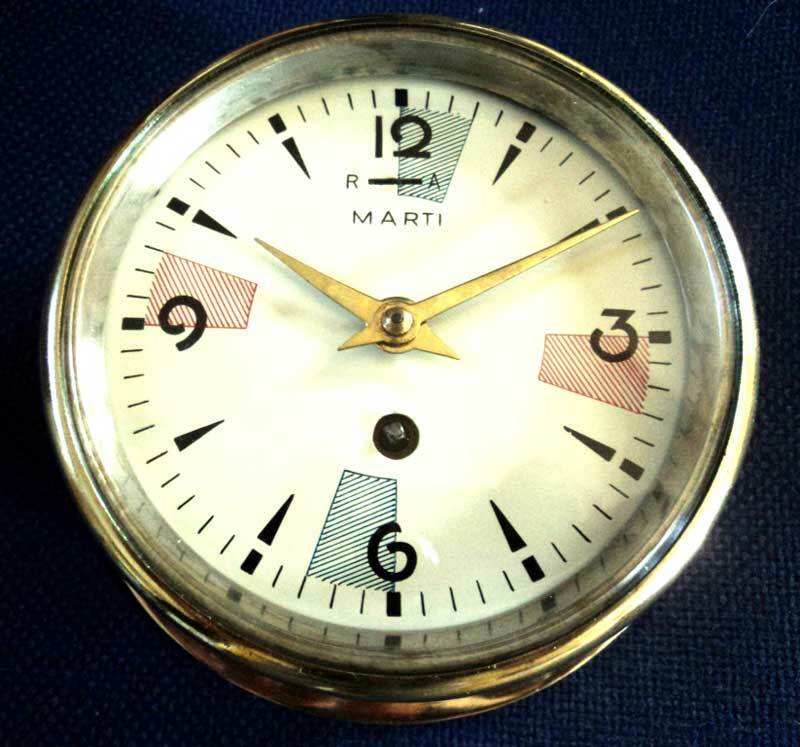 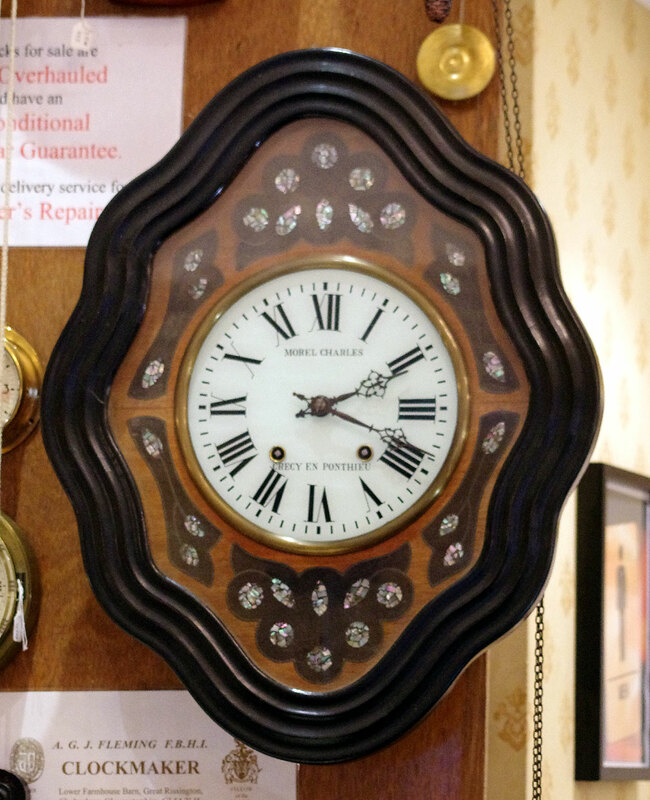 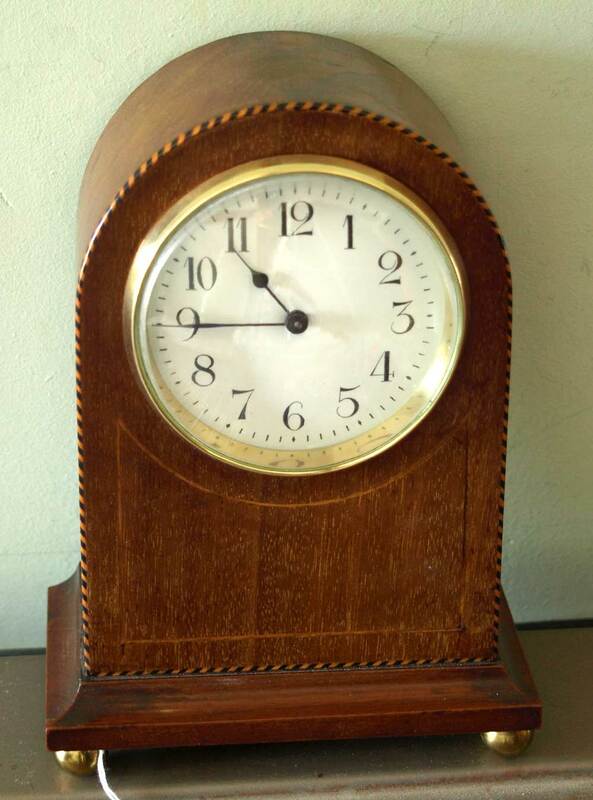 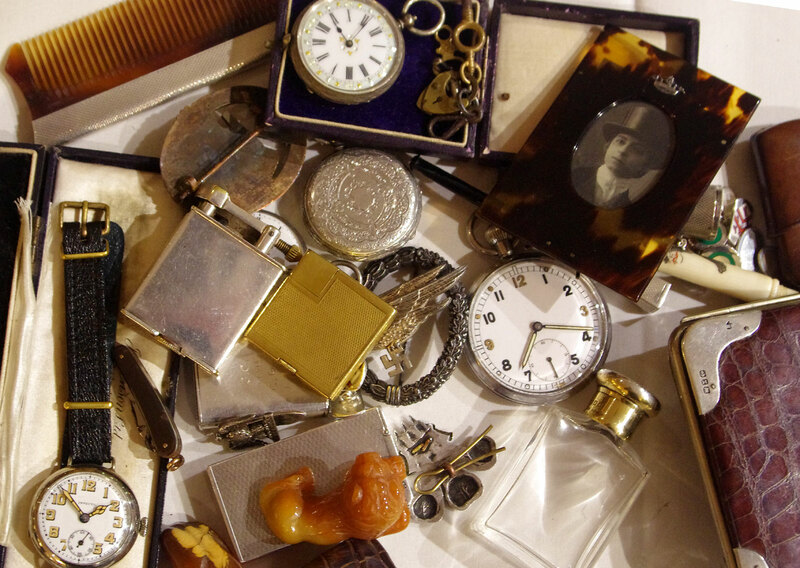 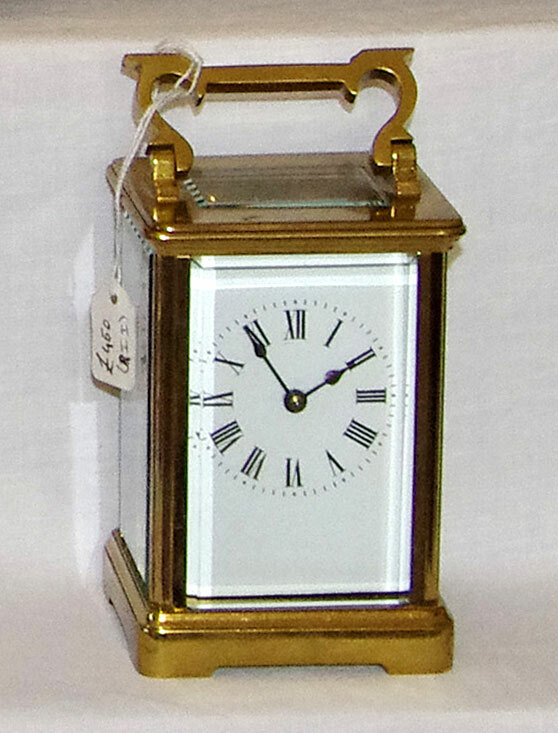 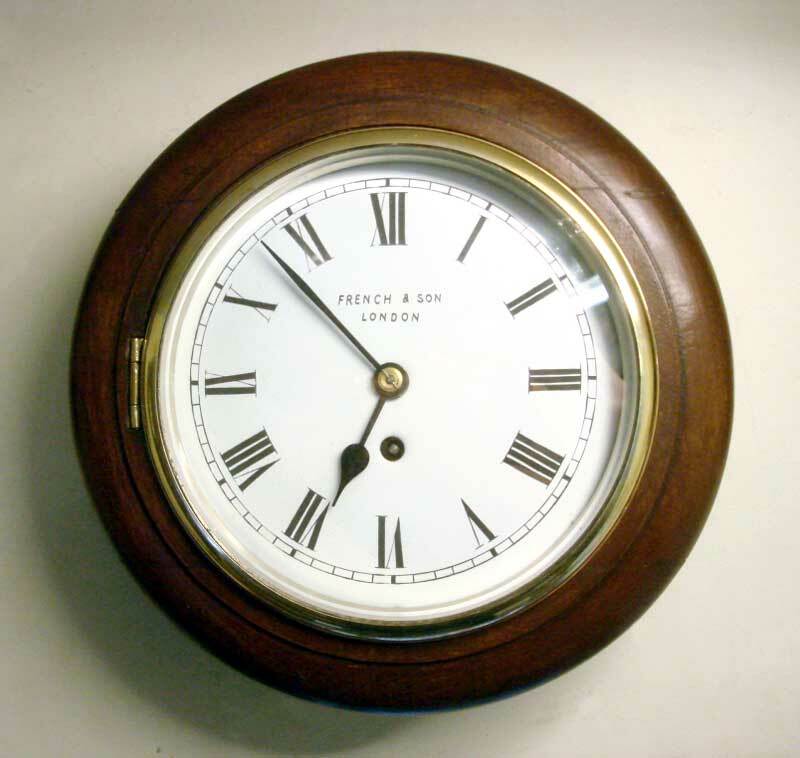 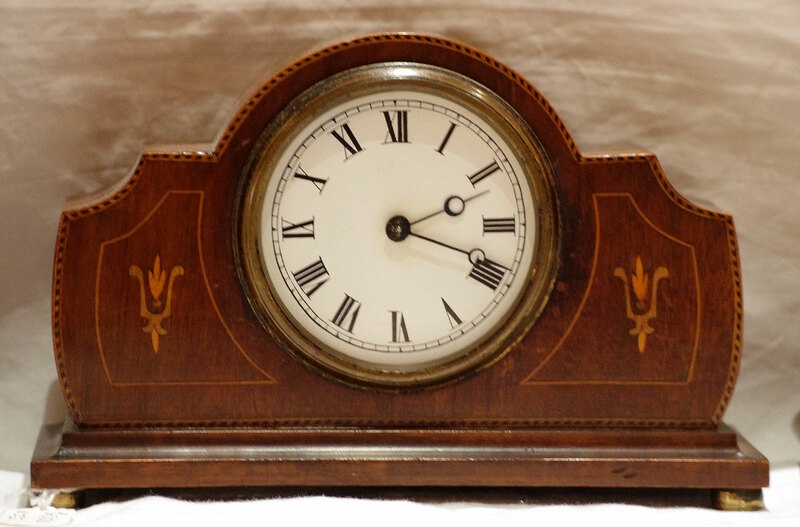 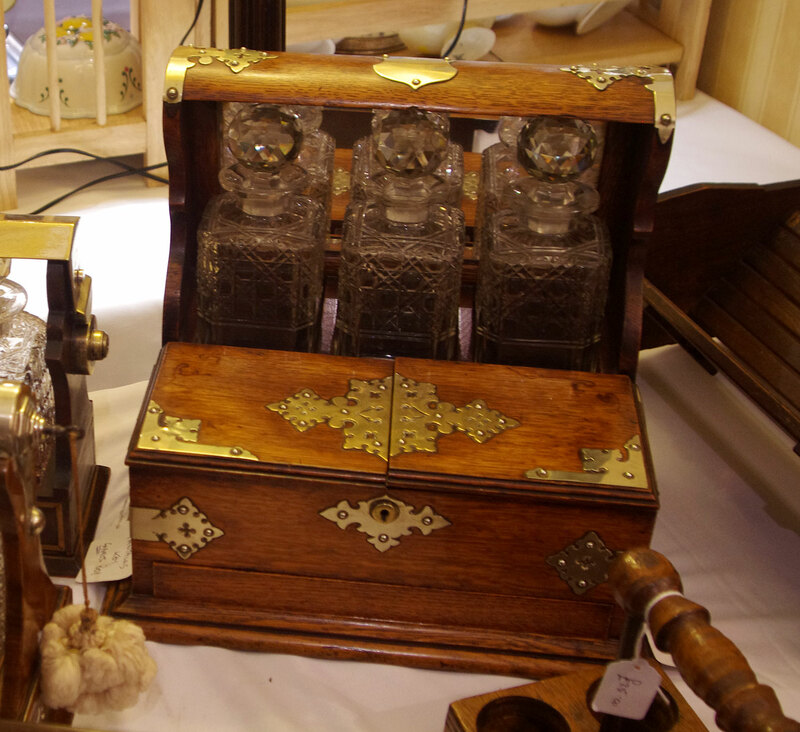 A fellow of the Fellow of the British Horological Institute, Andrew established his workshop some thirty years ago, and now deals in almost everything clockwork, from clocks, toys and music boxes to barometers and barographs. 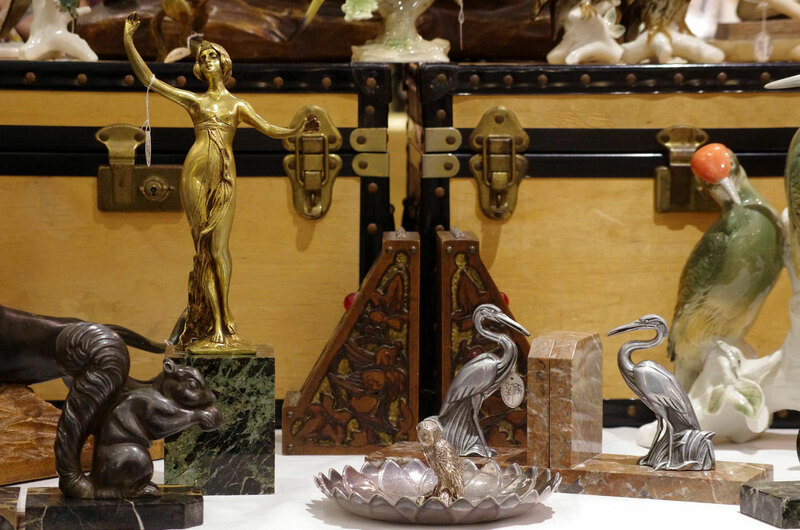 Peter Forbes is one of those dealers that everybody knows - not only because he seems to have been around for ever, but because his stock, once seen, is never forgotten. 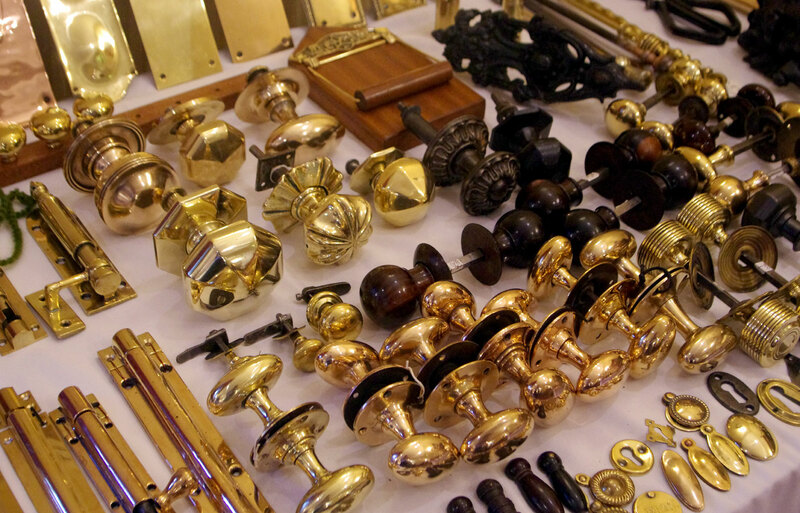 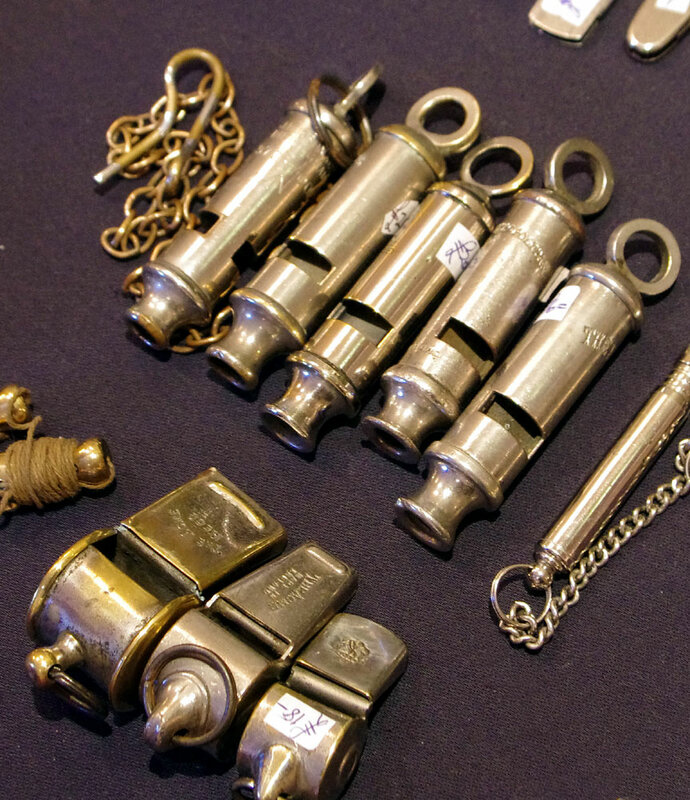 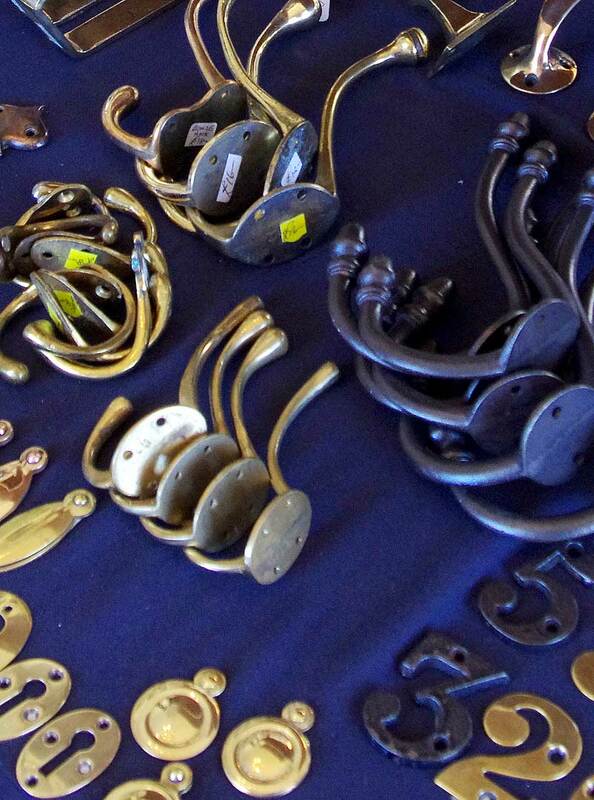 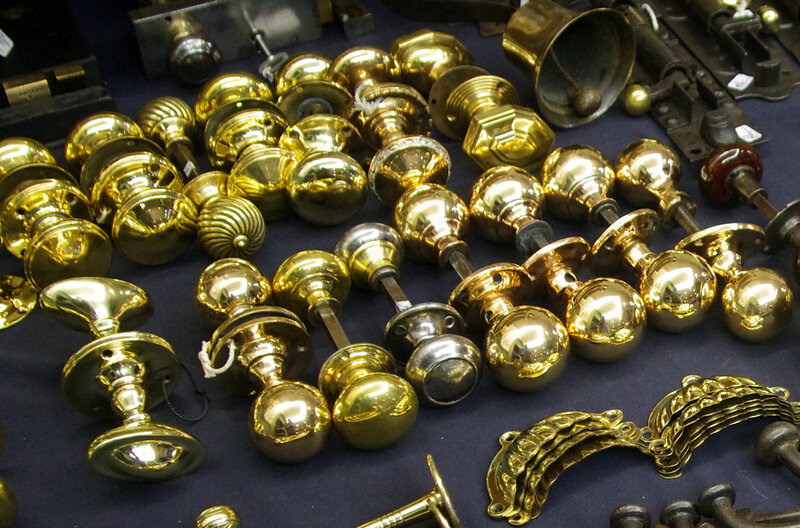 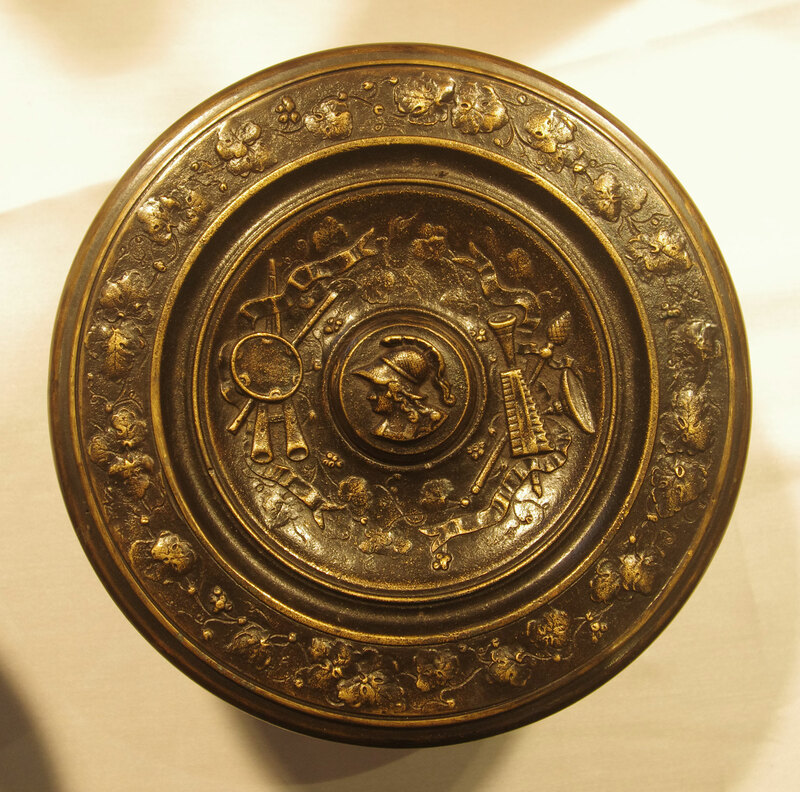 Peter offers genuine antique door furniture, from solid brass knockers, handles and letterboxes, to coathooks, escutcheons and plates. 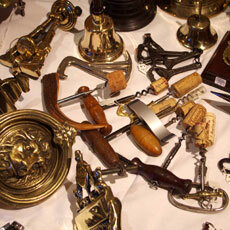 Dotted in among will be a few choice 'Mantiques'. 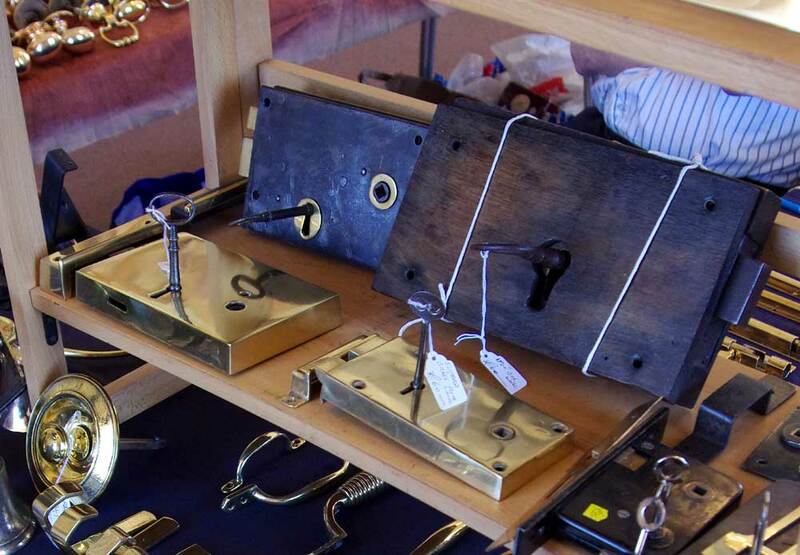 Peter regularly trades in Oxford (Thursday Market) and Cirencester (Friday) and can be contacted through this website. 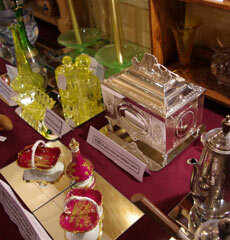 Additional images from his stock are included on the pages from earlier fairs. It has been many years now since Gladys Arnott last missed a fair at the Holt. 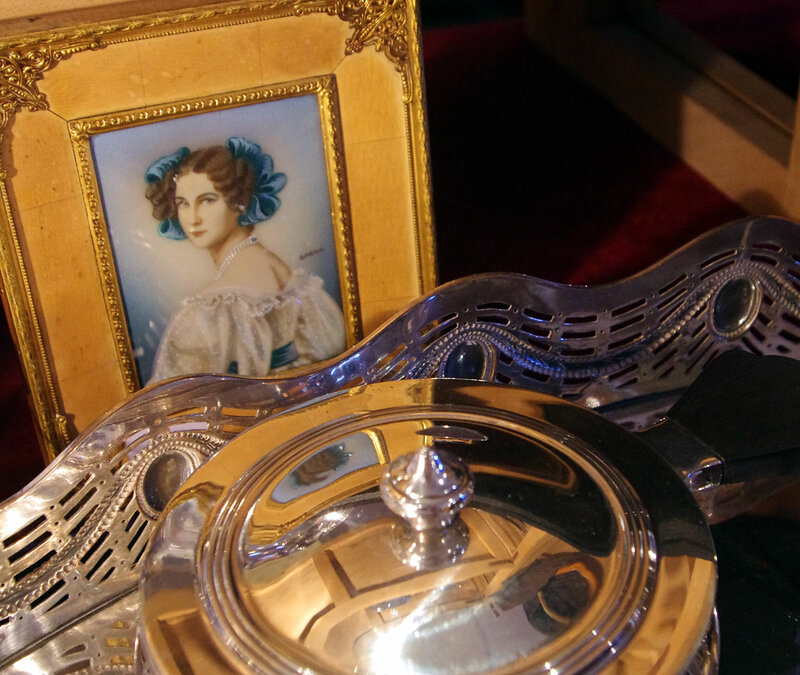 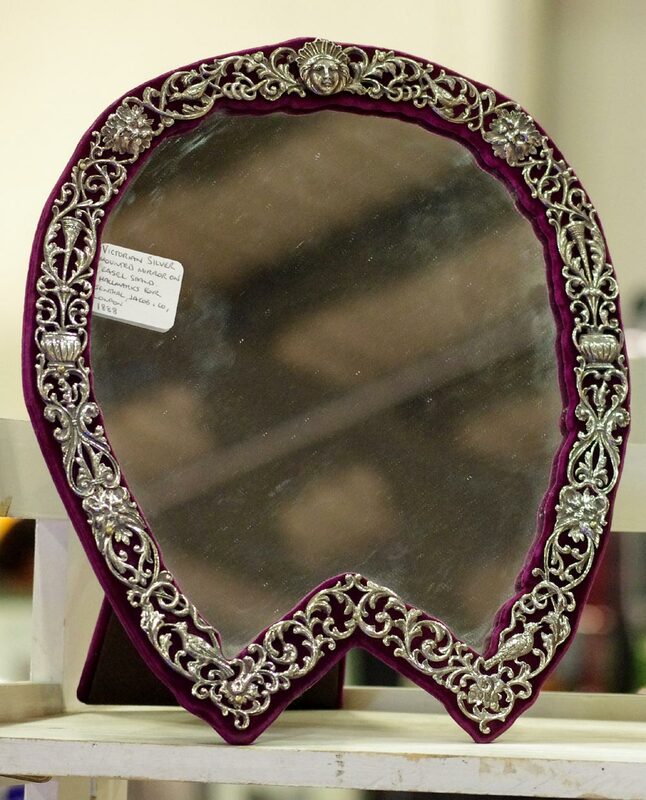 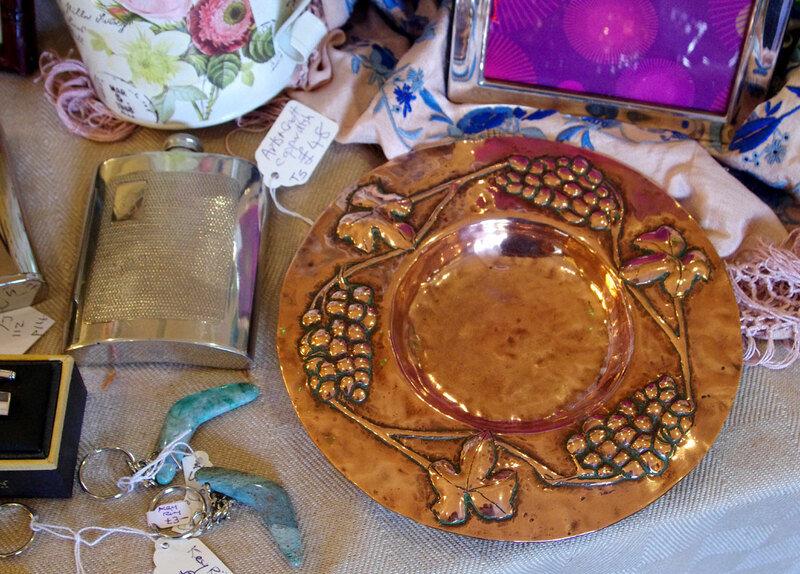 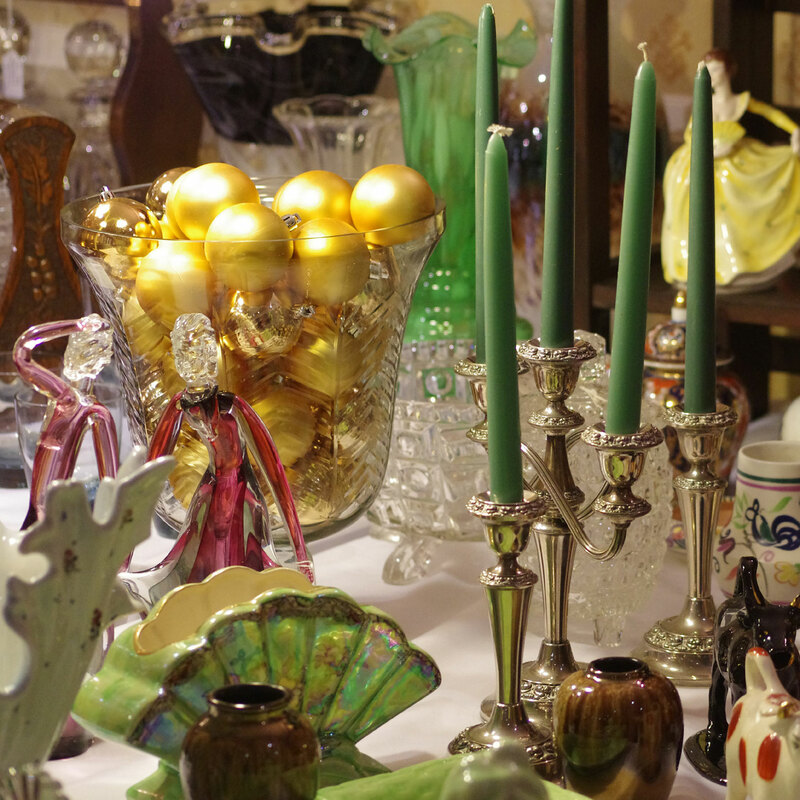 She always achieves an eye-catching mix of vintage and traditional antiques, with a generous smattering of top quality 'ladies accessories', ceramics, glass, silverwares, pictures and jewellery. 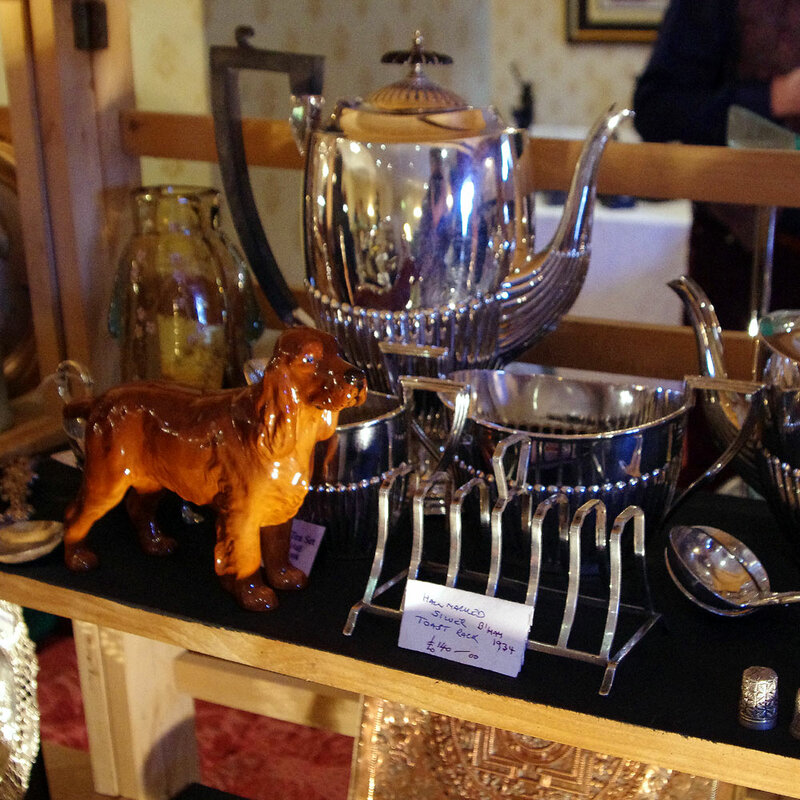 We were delighted when she had one of her "best ever" fairs in November 2018. 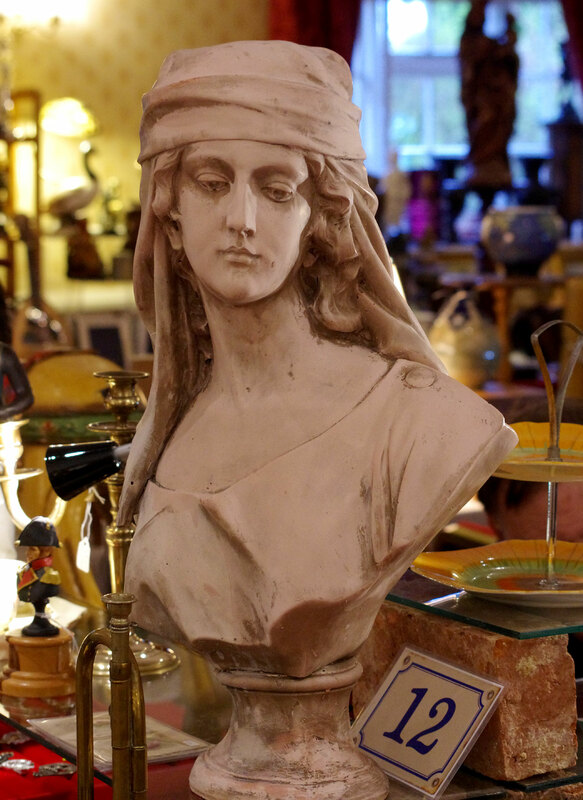 Gladys can be contacted through this website. 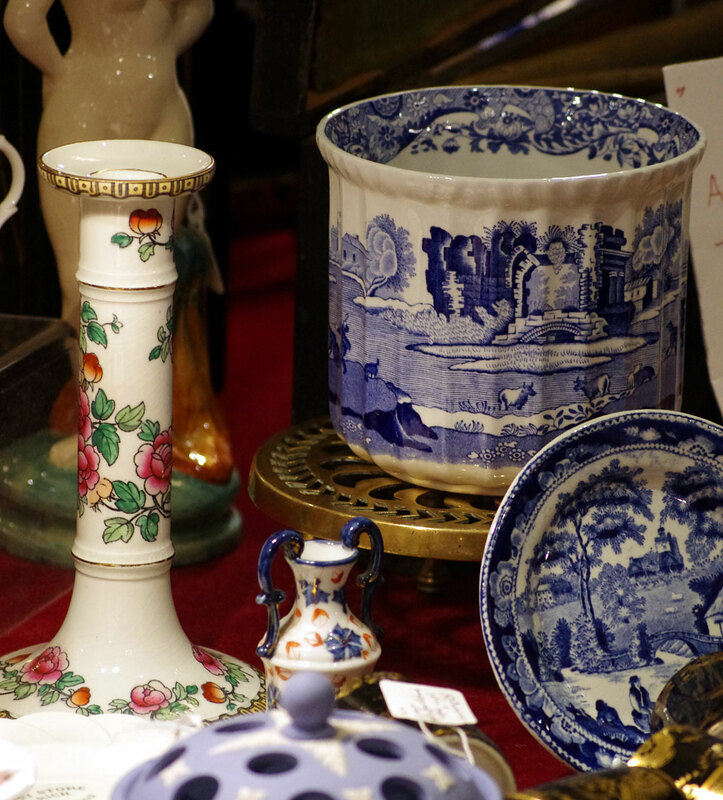 As a lecturer for some of London's top museums, and with an encyclopedic knowledge of early 19th century antiques, Ted Gribben's pitch is invariably one to marvel at. 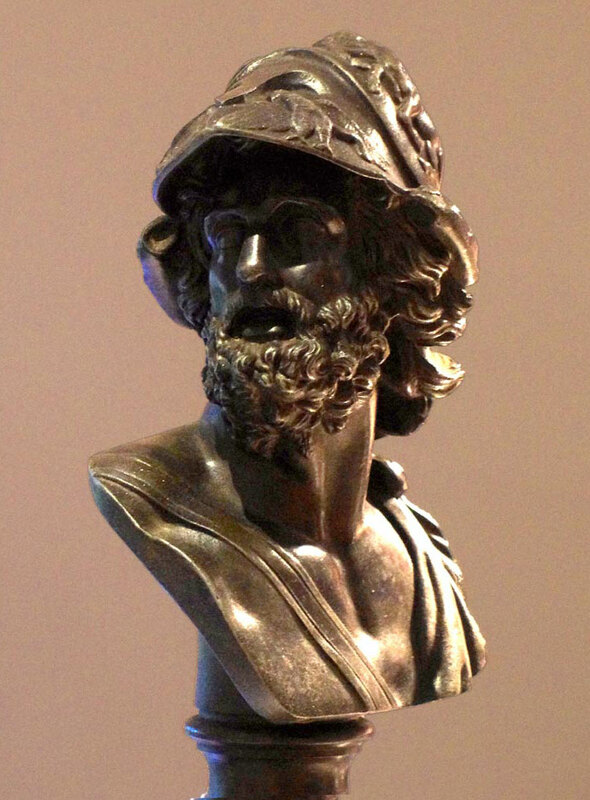 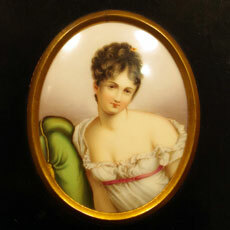 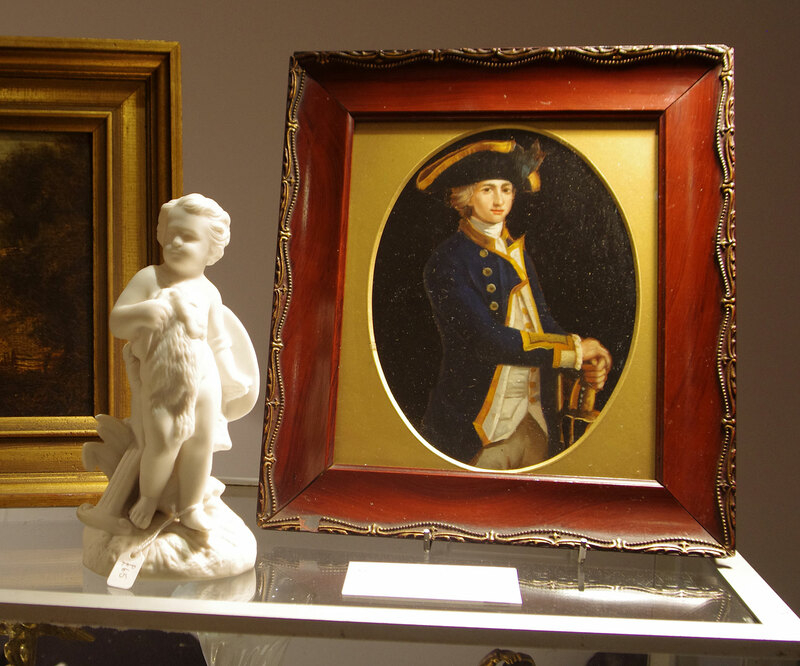 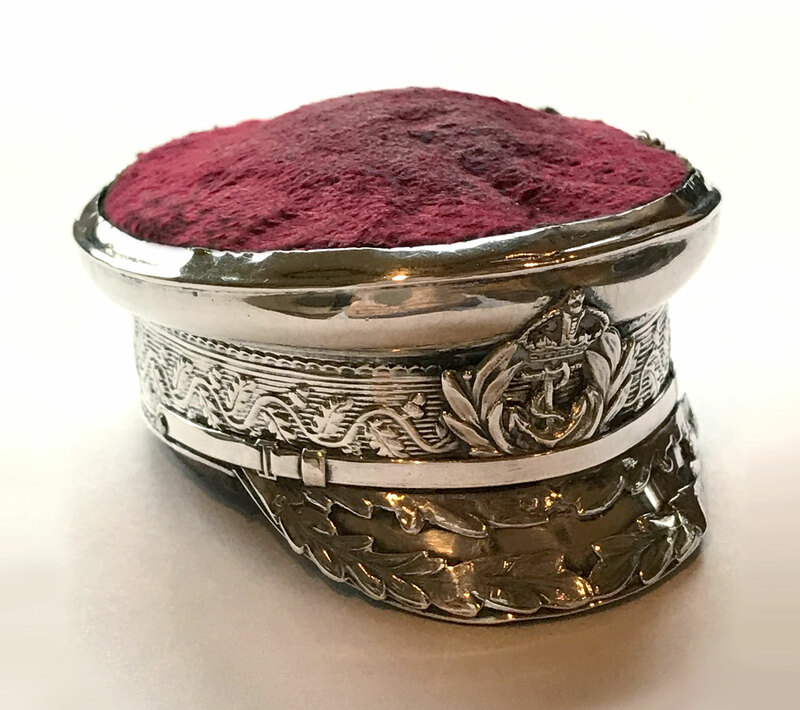 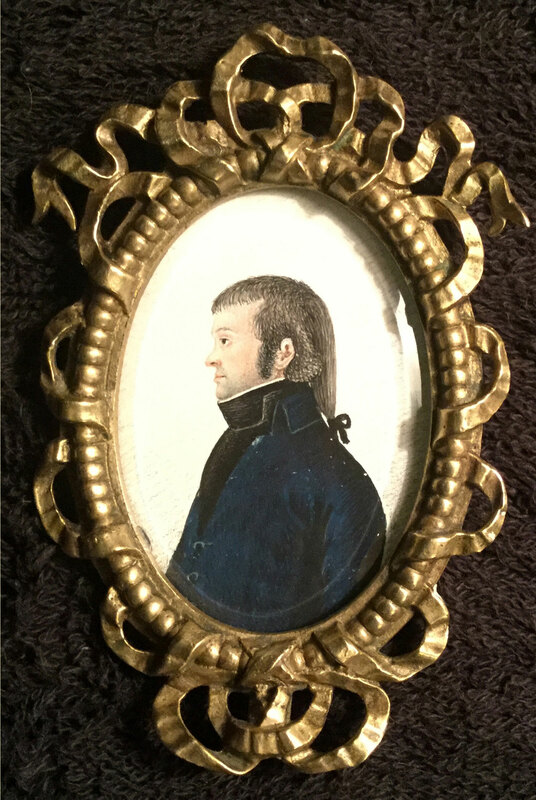 Period bronzes from the late 18th century, exquisite portrait miniatures, fine art paintings, iconic silver and always a choice selection of delightful "smalls", from snuff boxes to card cases. 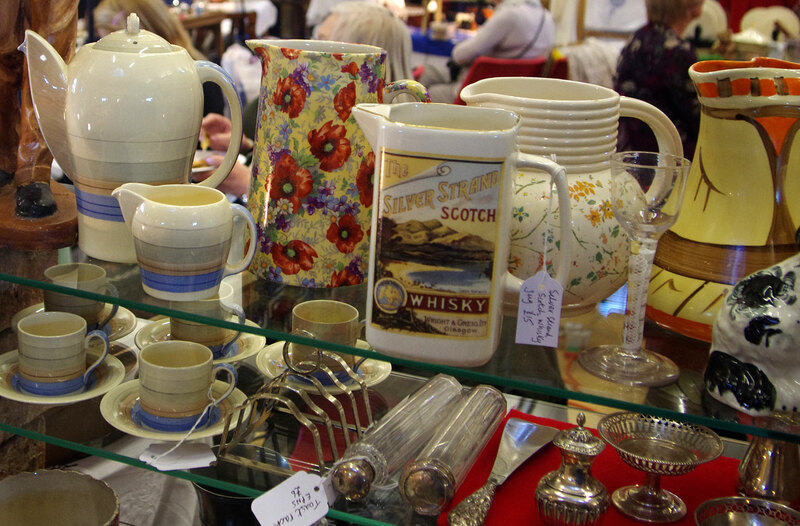 Jean has been a regular at The Holt since the beginning, and says she wouldn't miss it "for the World", so we're delighted that she's with us again in March, bringing more of her carefully selected items. 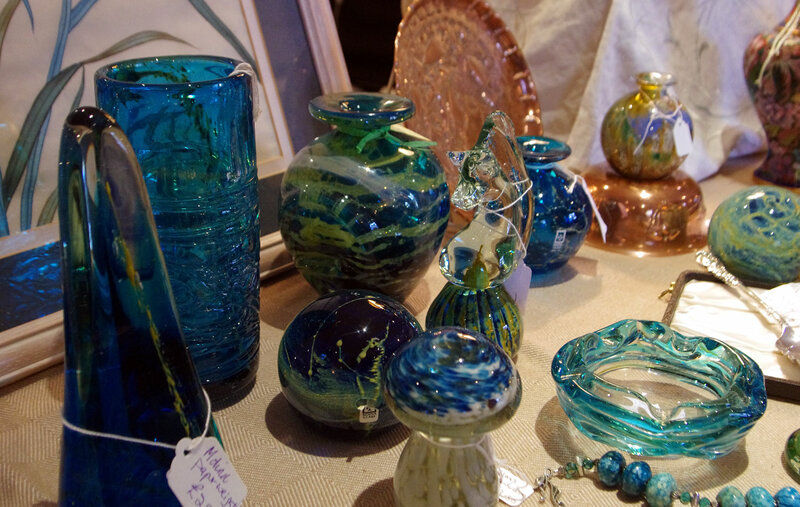 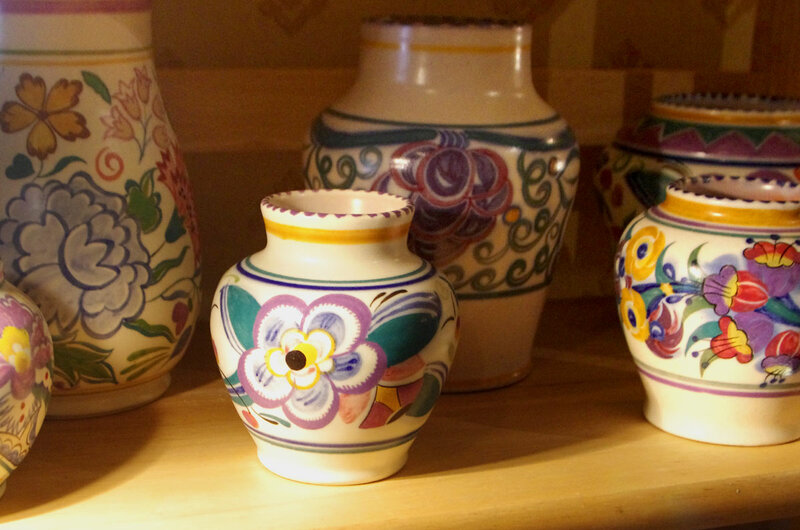 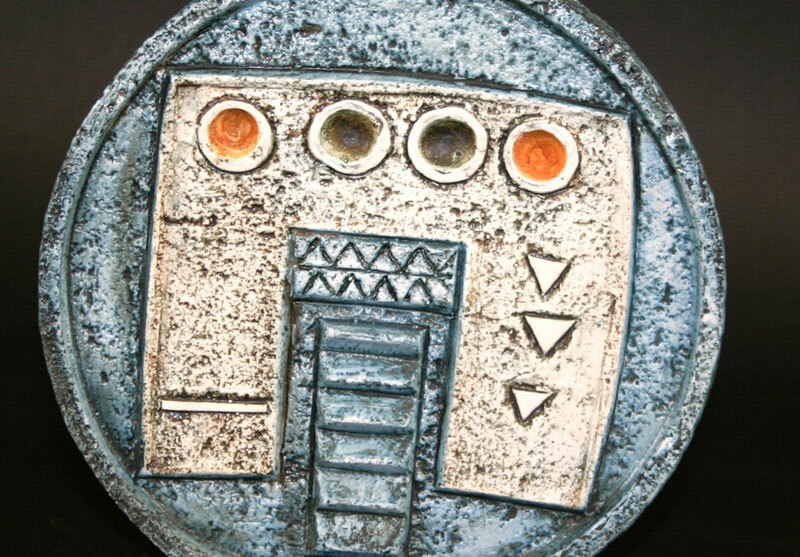 Among her favourite stock items are pieces of art glass (especially blue-green Mdina), porcelain, prints, paintings, silver, jewellery, platedwares and art pottery. Jean can be contacted through this website. 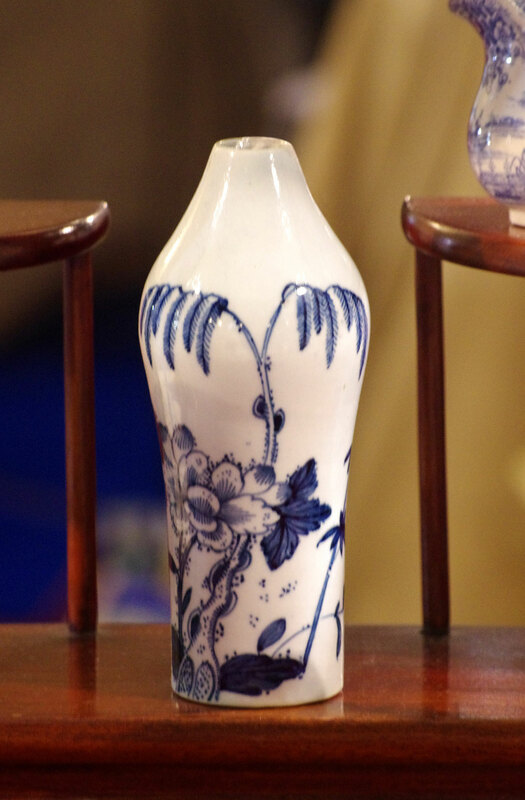 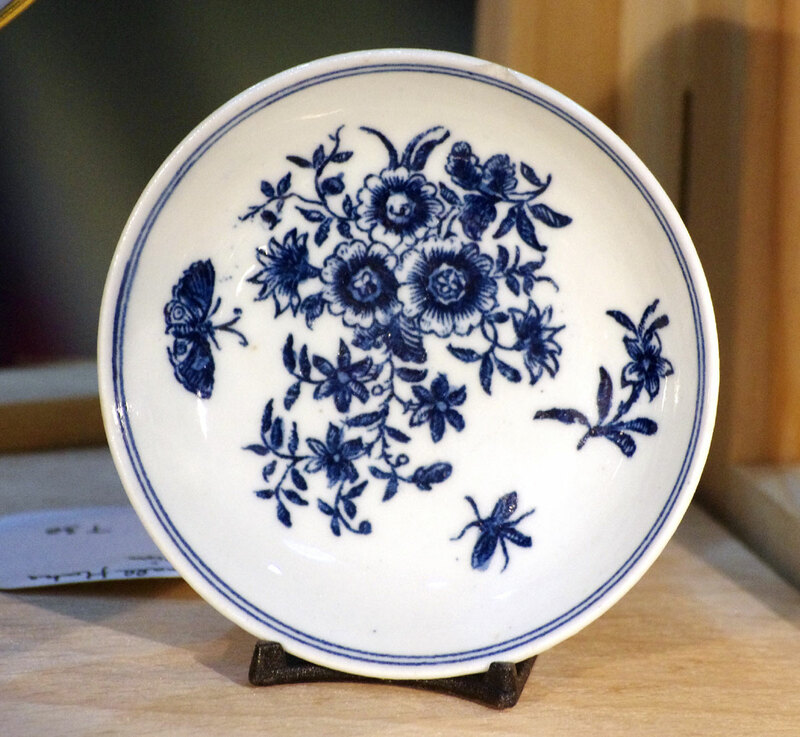 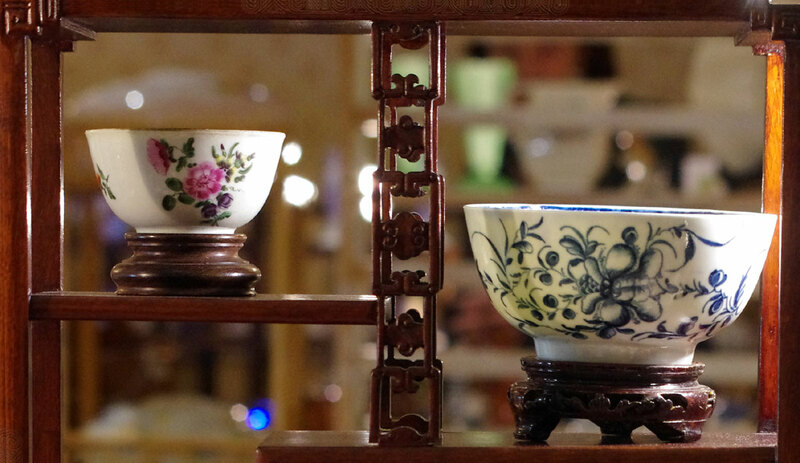 Although Dittany’s passion is for early English and Chinese porcelain, from the 18th Century or before, her stock has broadened in recent years to include later examples of top-quality ceramics, particularly teawares, as well as Mauchlineware, crystal glasswares, curios and the occasional Ming dynasty ginger jar, and items of feline interest. 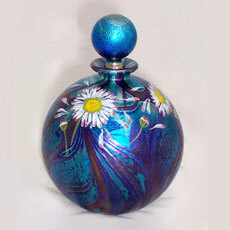 Dittany can be contacted through this website. 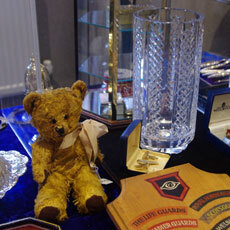 Graham has stood with us several times over recent years. 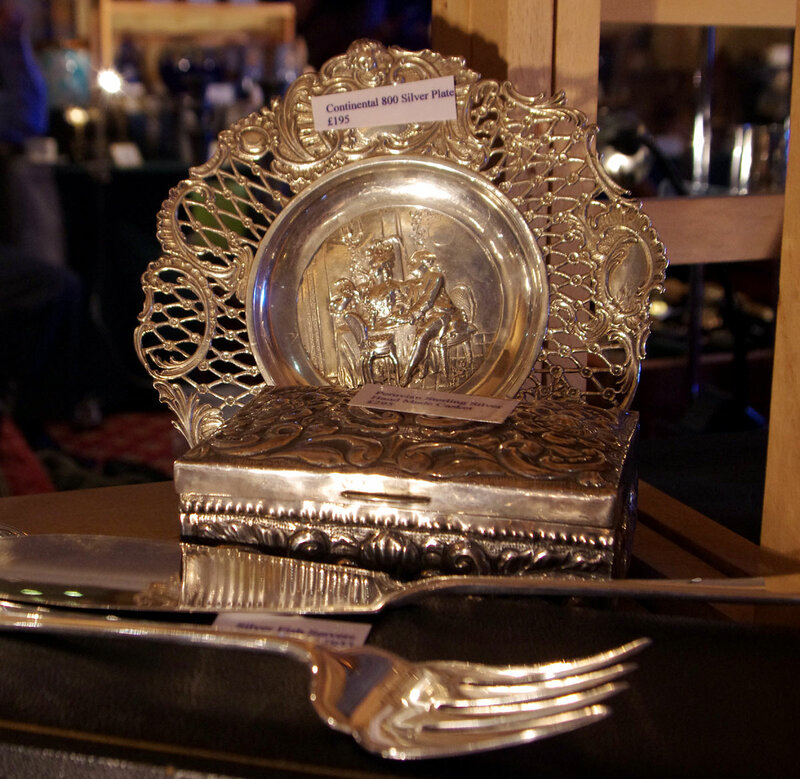 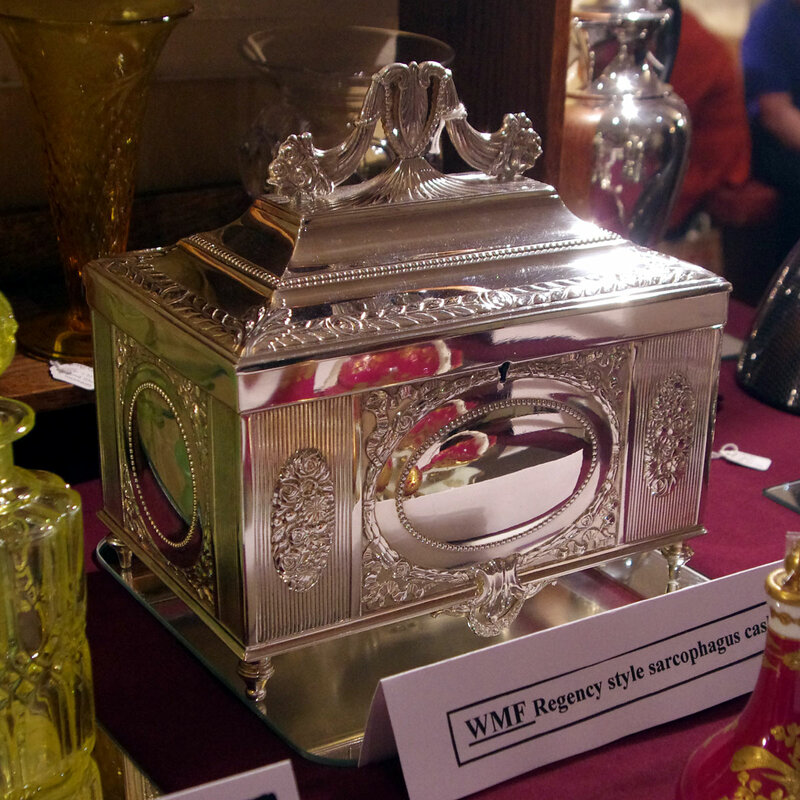 This November he will bring a selection of British and Foreign silverwares dating from the 18th to the 21st Century, along with a range of ceramics including Royal Worcester, Doulton, Royal Copenhagen and Derby; also present will be some select examples of period jewellery, objets d’art and watercolours. 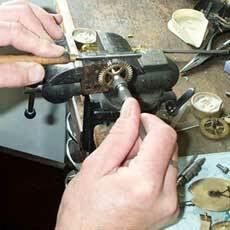 Graham can be contacted through this website. 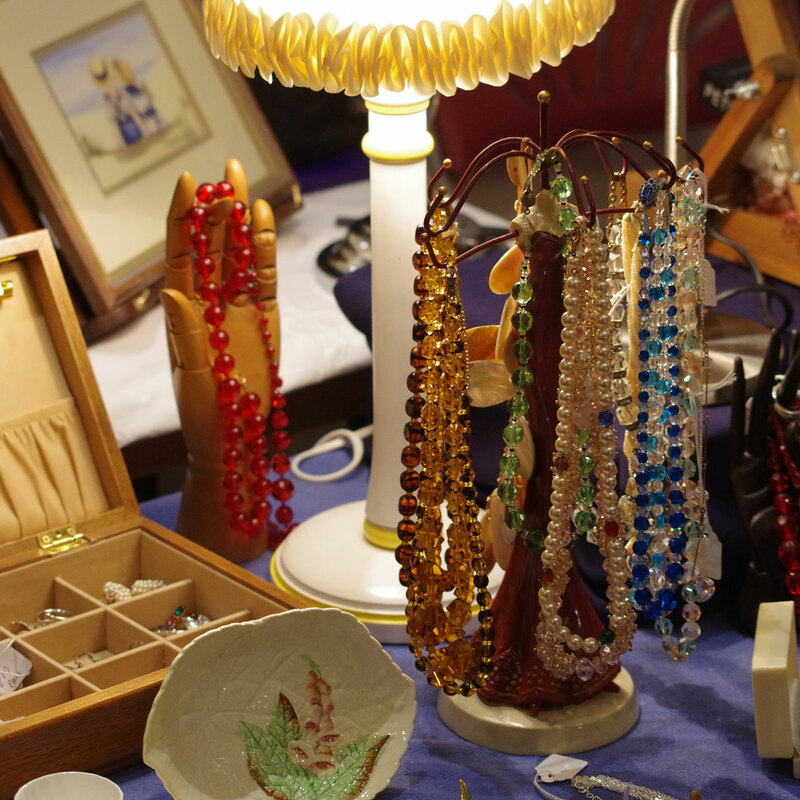 Paul and Judy are one of the hardest-working dealers on the circuit, stalling out at two or three fairs almost every week. 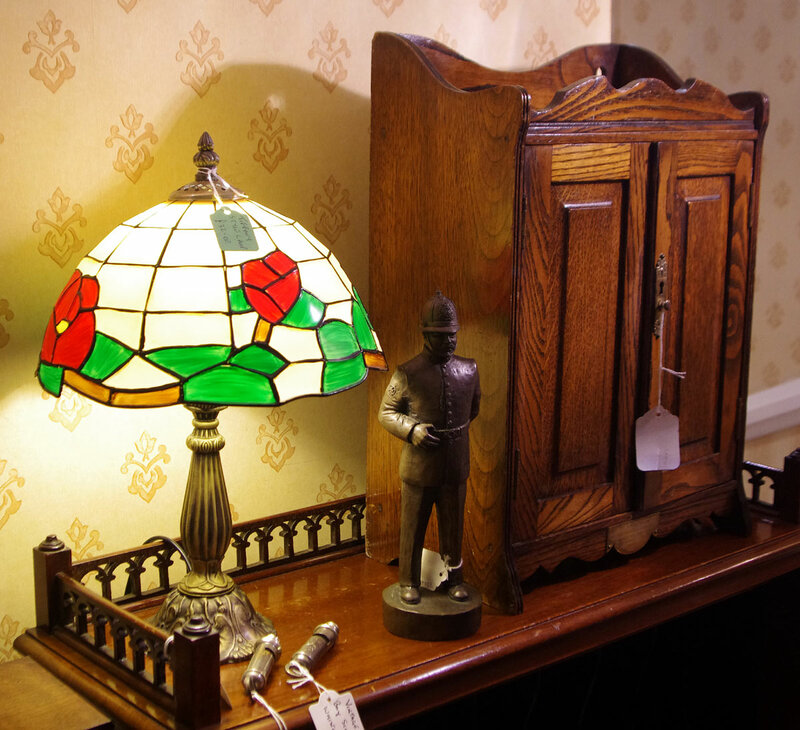 They return to The Holt with another fine selection of period furniture bedecked with fascinating antiques and collectables. 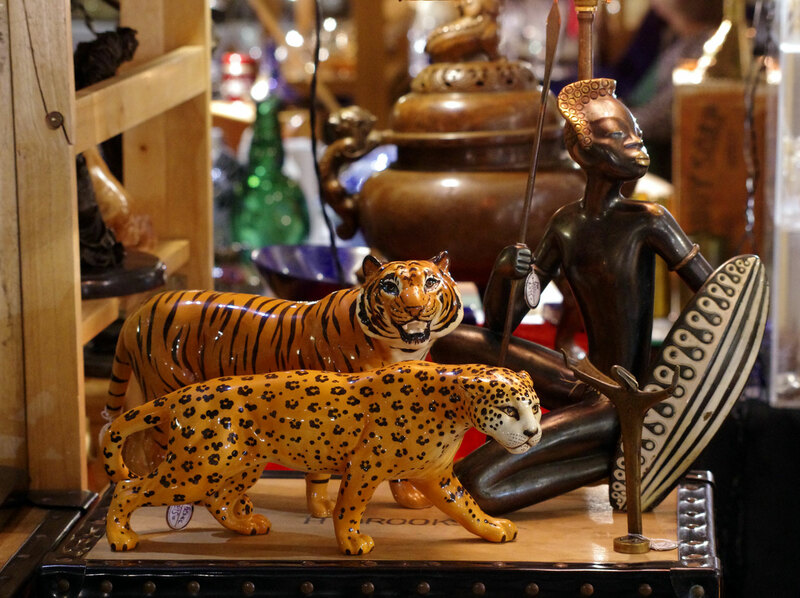 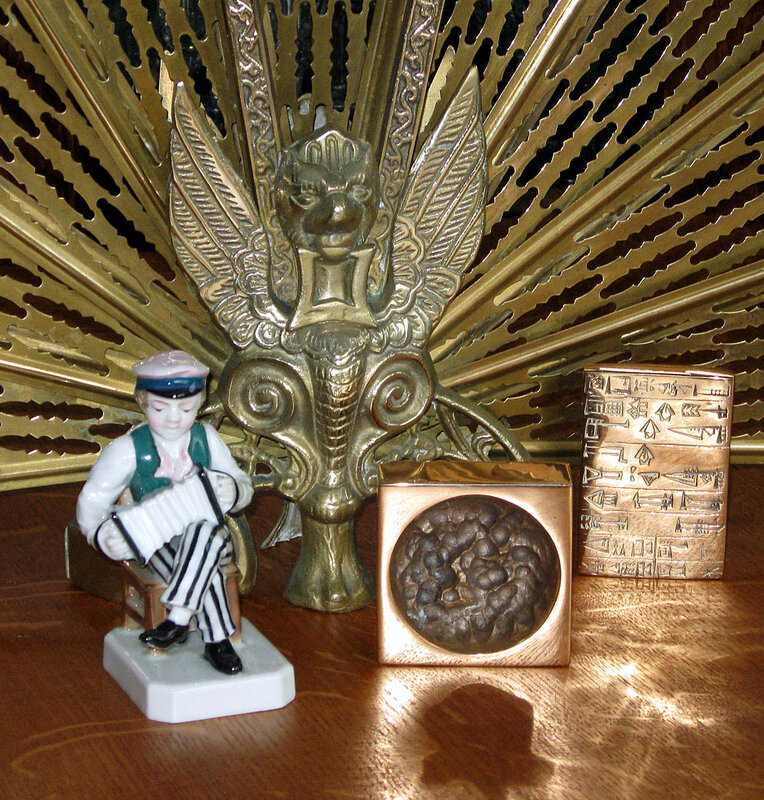 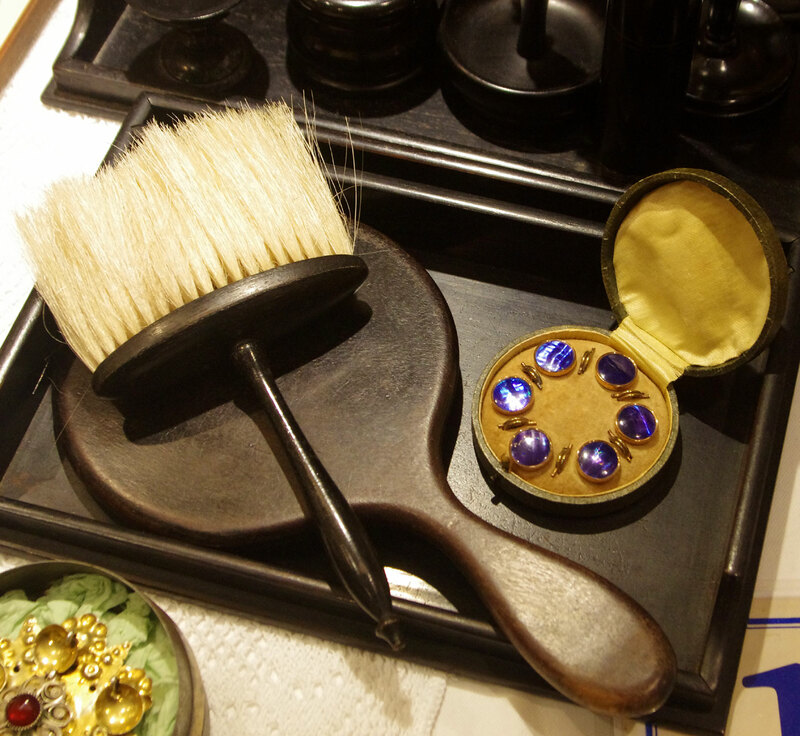 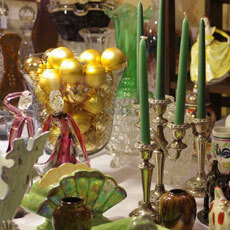 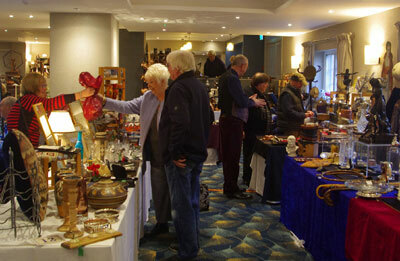 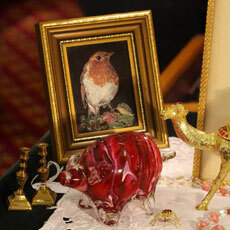 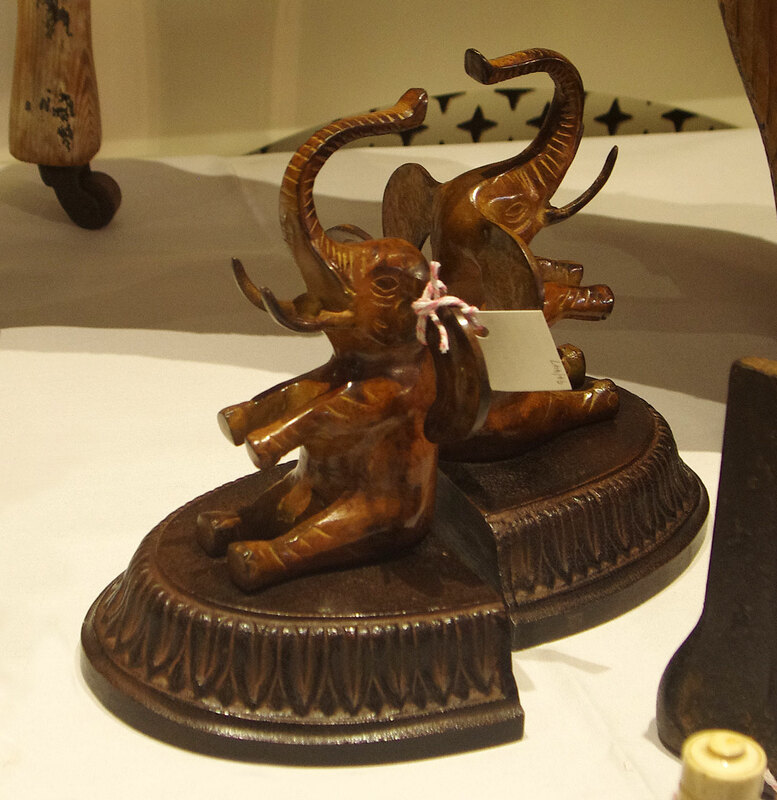 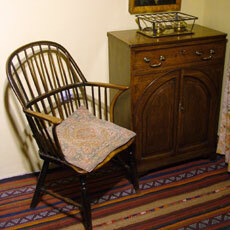 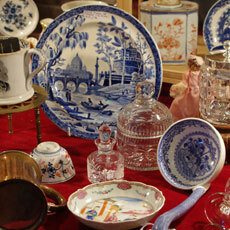 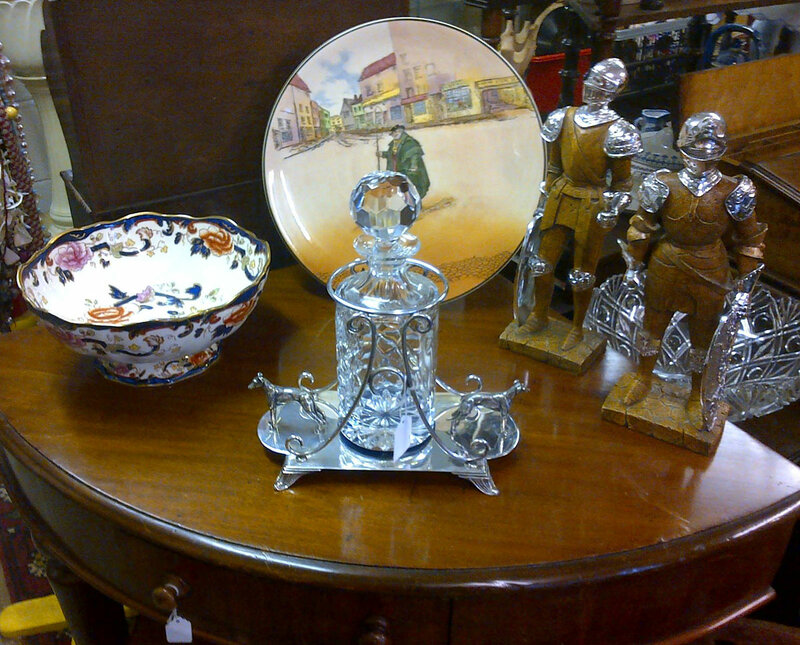 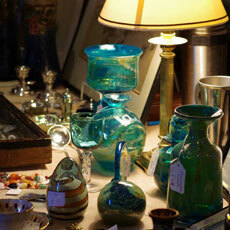 Expect small items of furniture, a few writing slopes, some tantali, silverwares, figures, mixed ceramics and some glass. 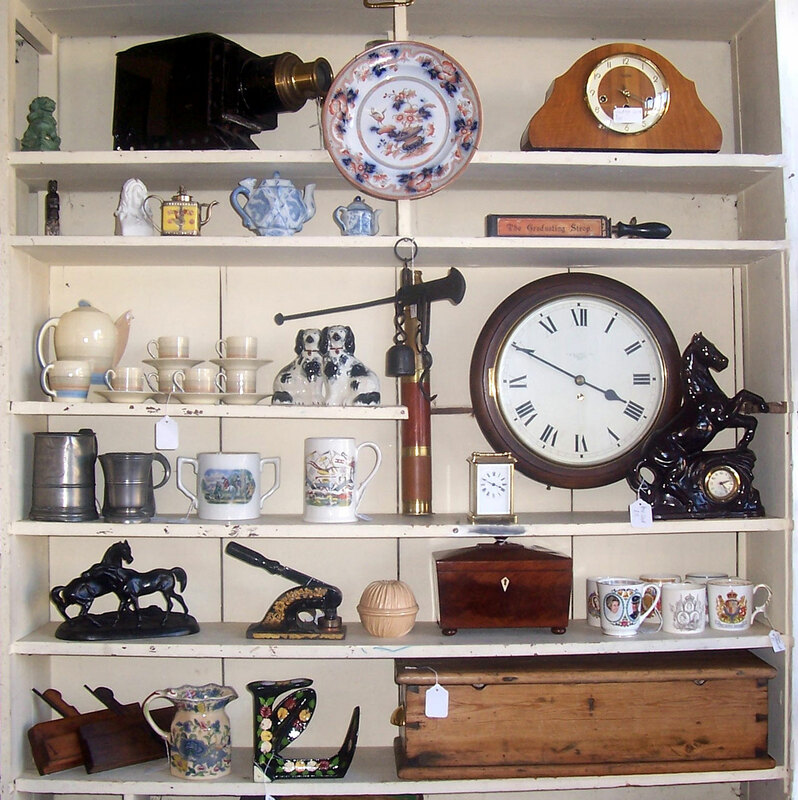 Paul and Judy can be contacted through this website or via Facebook. 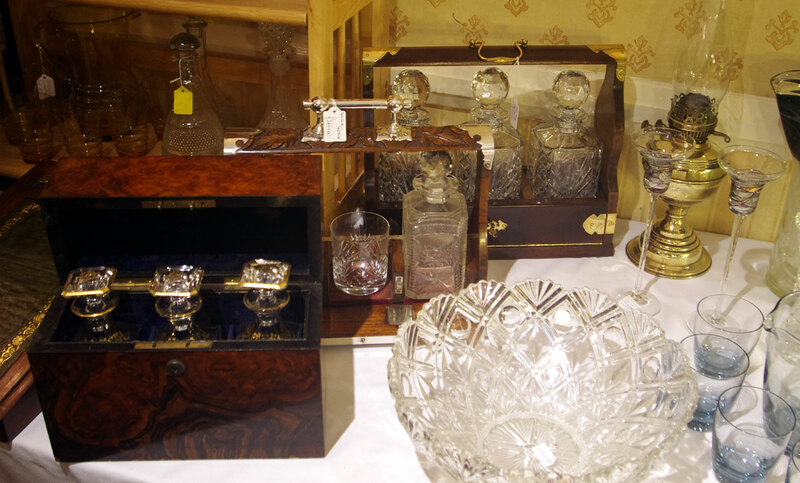 Tony and Jill Worthington came back to their usual pitch for November, and offered another characteristically exquisite selection of items. 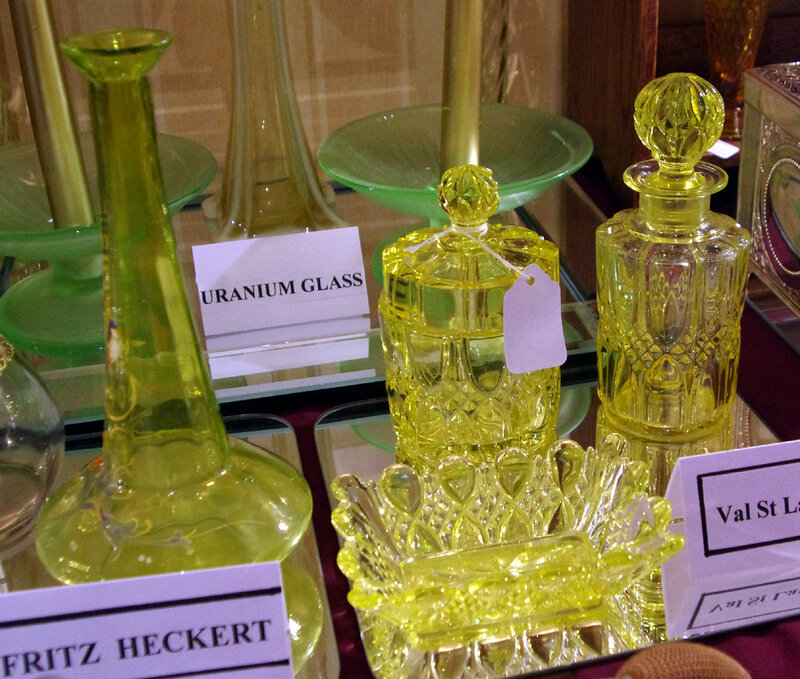 Jill has a penchant for scent bottles and glass, with a special interest in 'Uranium' pieces, while Tony's contribution tends to be focused on ceramics and silverwares, especially Royal Doulton and Poole and Objets de Vertu. 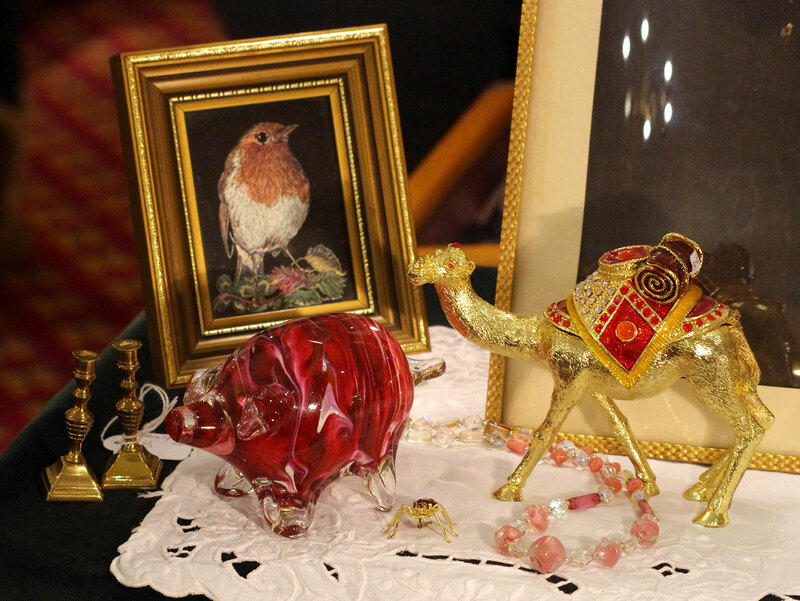 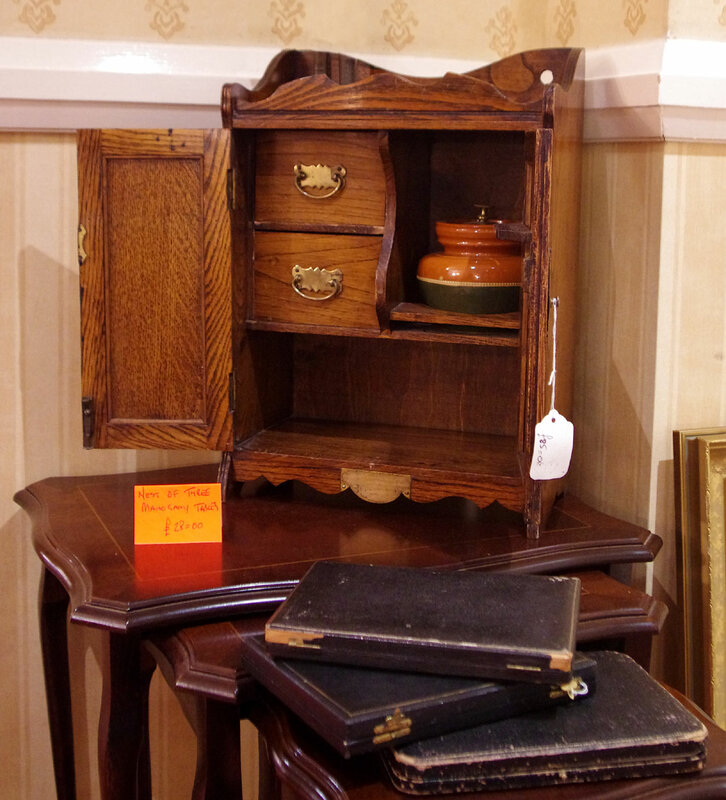 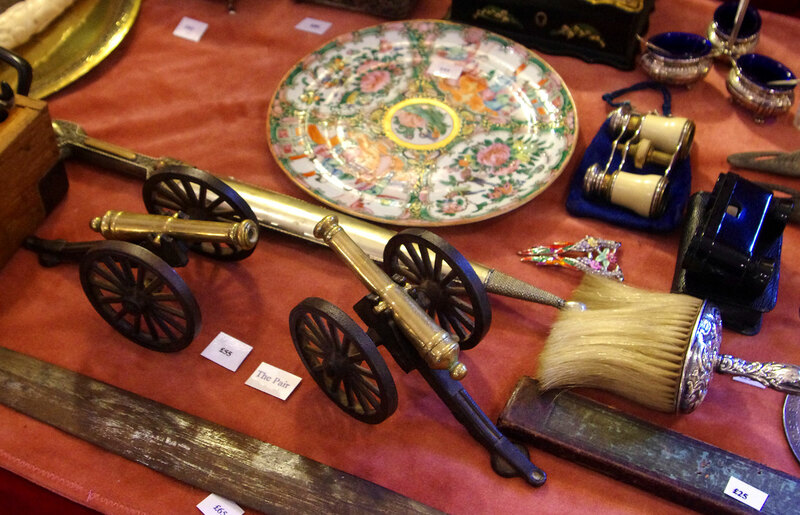 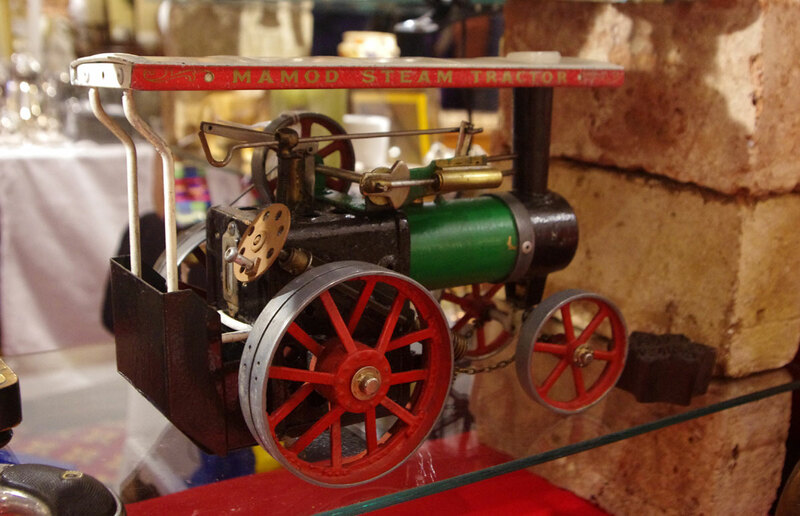 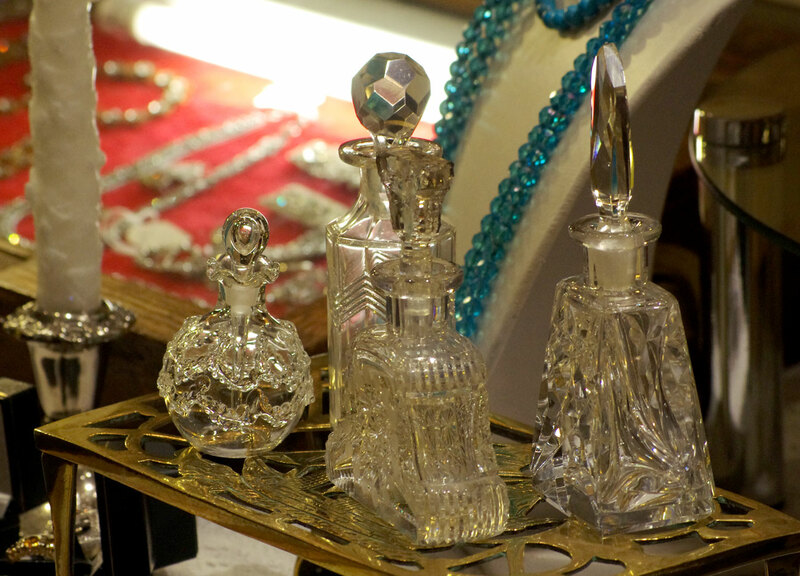 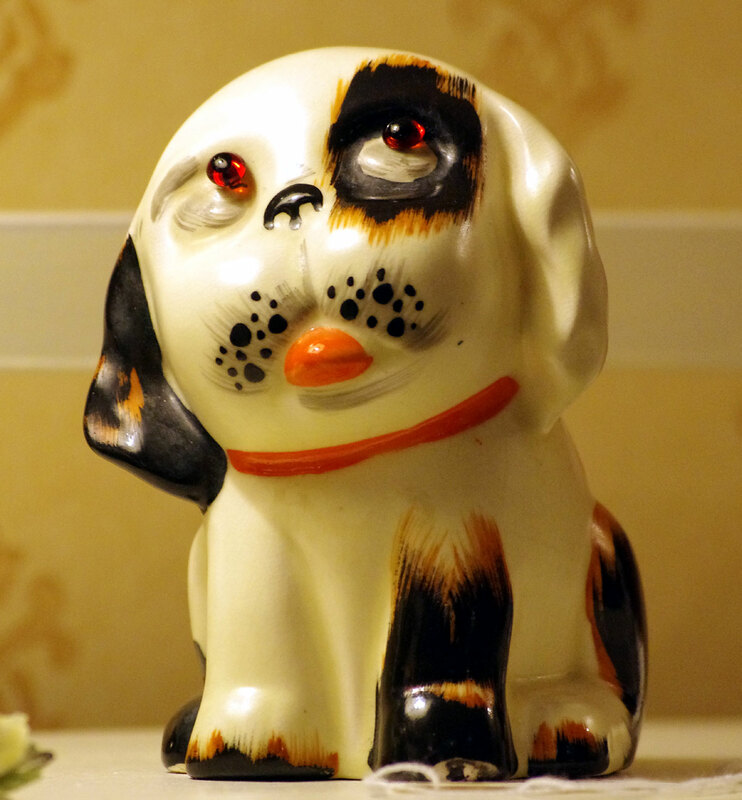 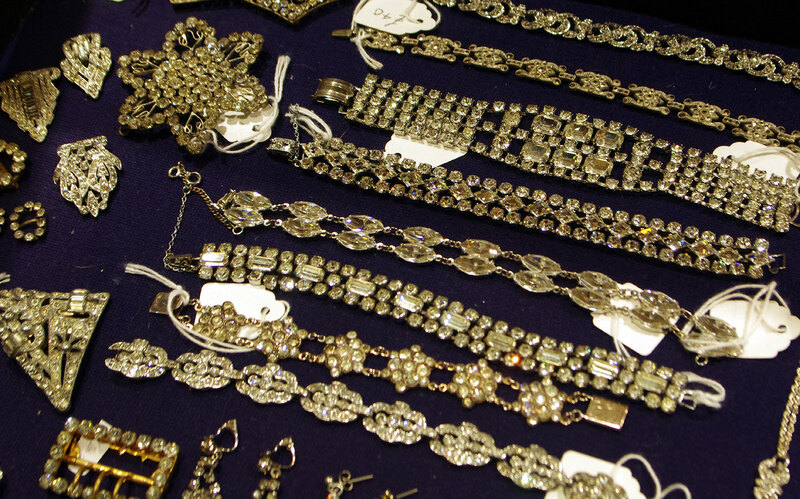 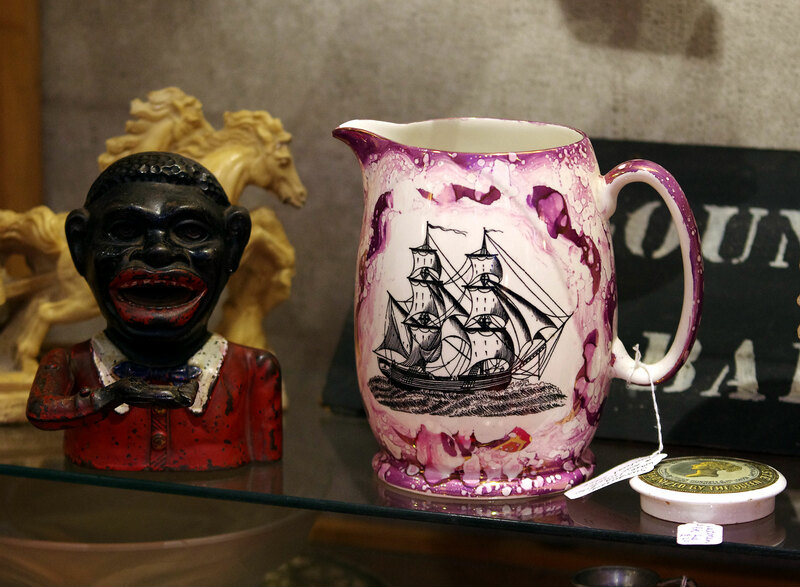 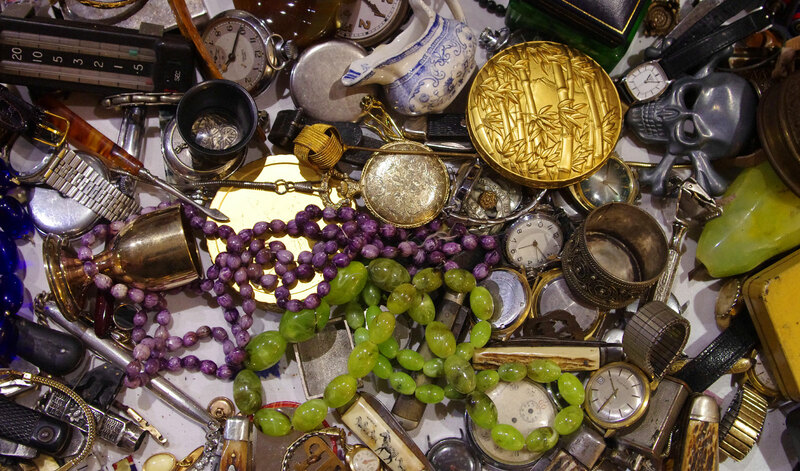 With more than 20 years' experience as a dealer in collectable antiques, Stephen's stall is a treasure trove of the kind of fascinating items that visitors can't walk by without a good "ruttle". 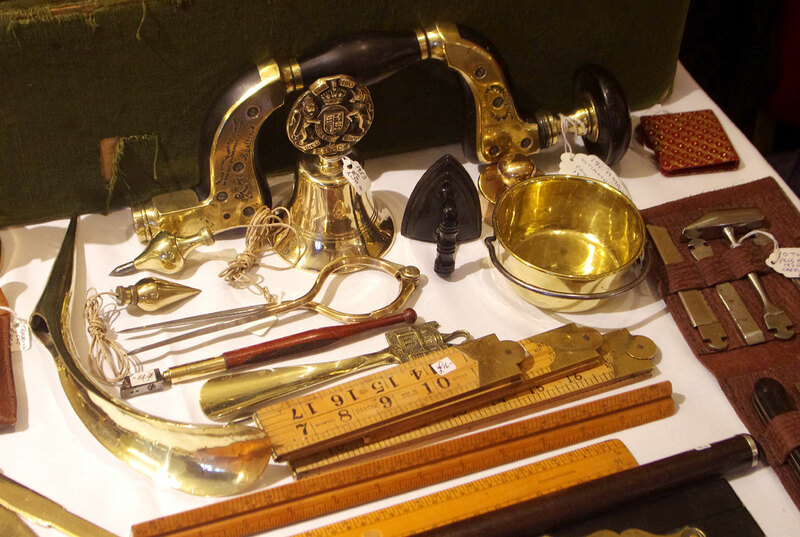 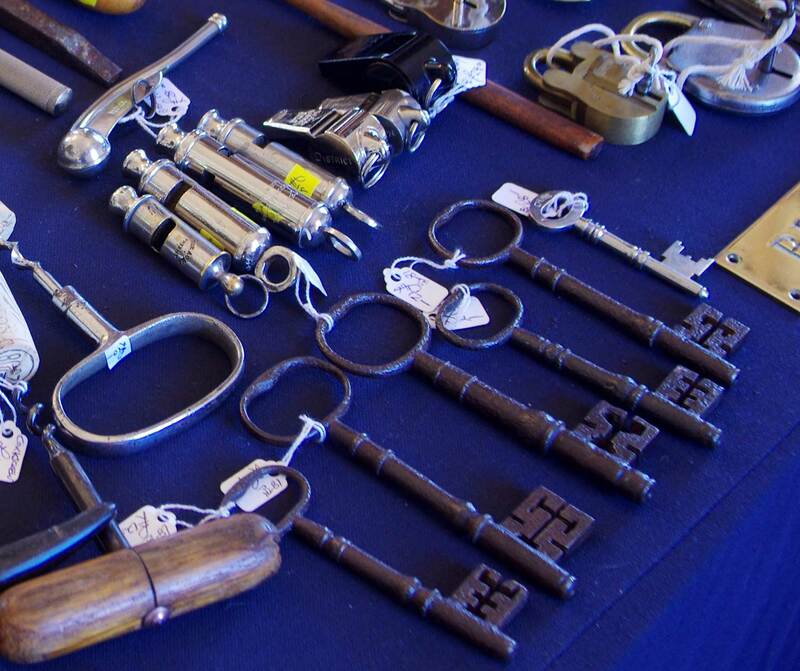 Penknives, pieces of treen, militaria, vintage watches, medals, carefully selected ceramics, brassware, silver, leathergoods, lighters, pieces of jewellery, and much more. 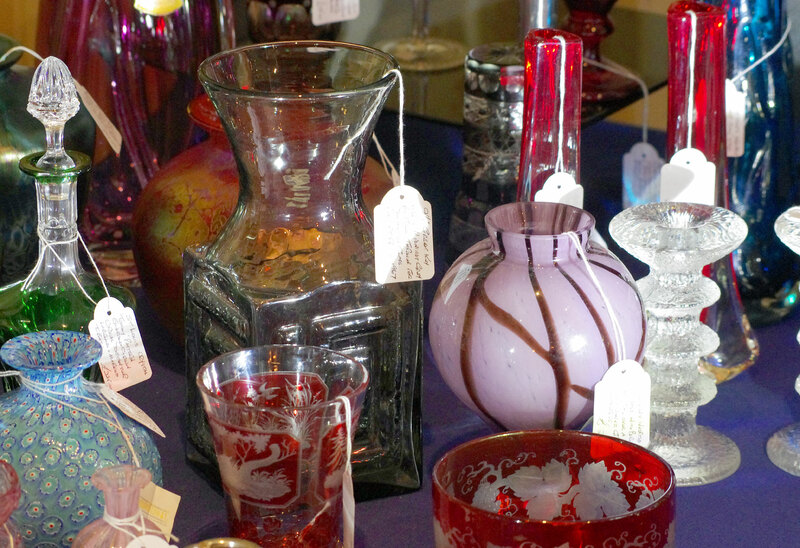 Michael and Rosemary will be familiar to many Cotswold-based collectors, who will have encountered their attractively-presented stock at fairs across the region, including the Friday market in Cirencester. 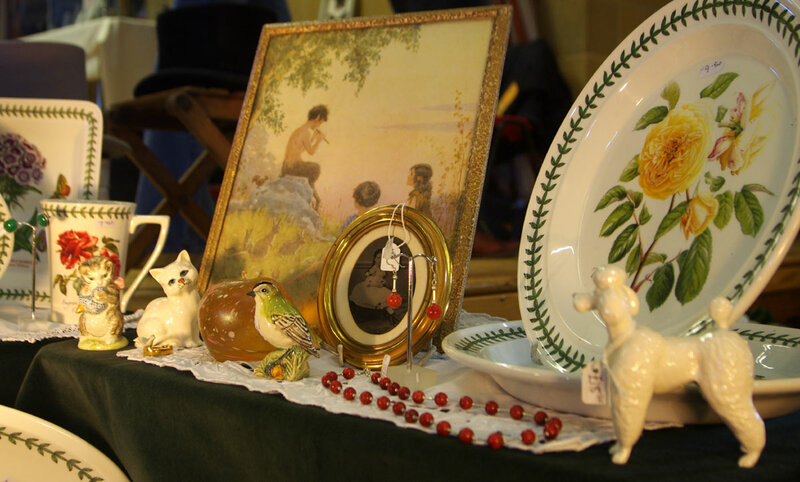 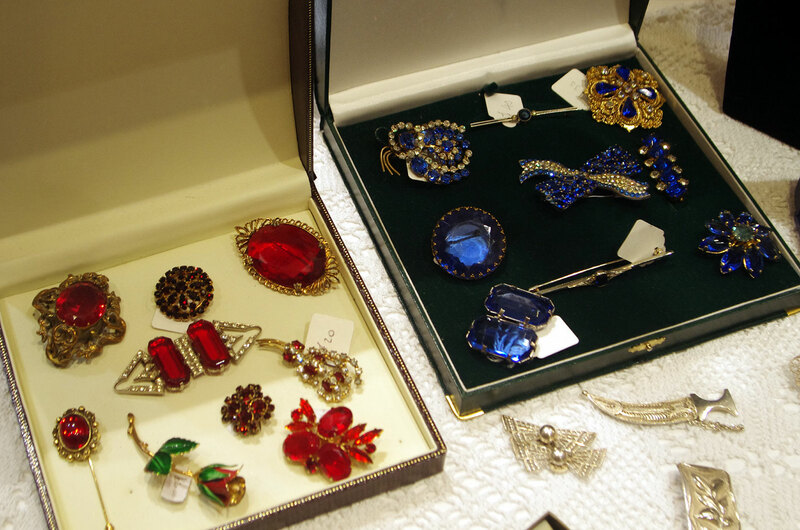 Rosemary has a keen eye for decorative items, with "ladies' accessories" vying for attention alongside jewellery, glass & ceramics. 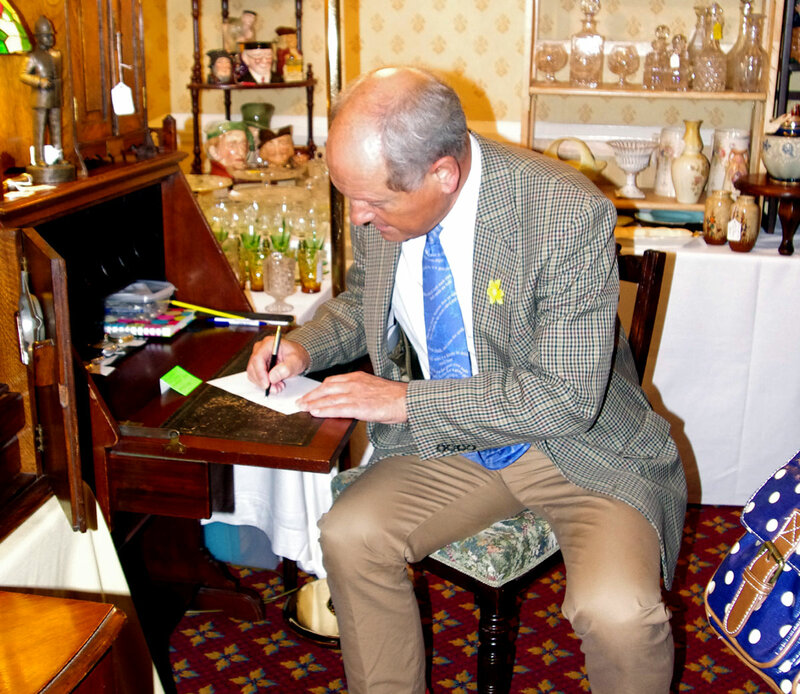 Edwin's intriguing stock has always been admired whenever he's appeared at The Holt - and was a particular favourite with Charlie Ross back in 2015. 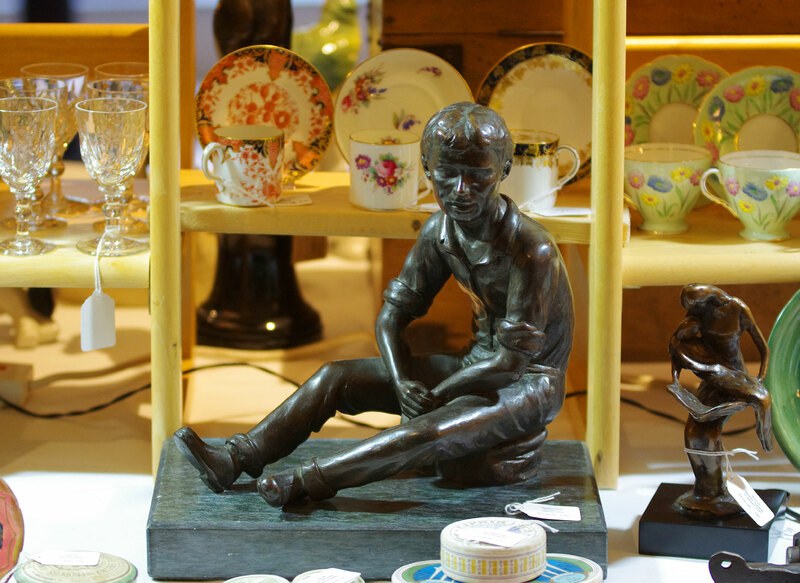 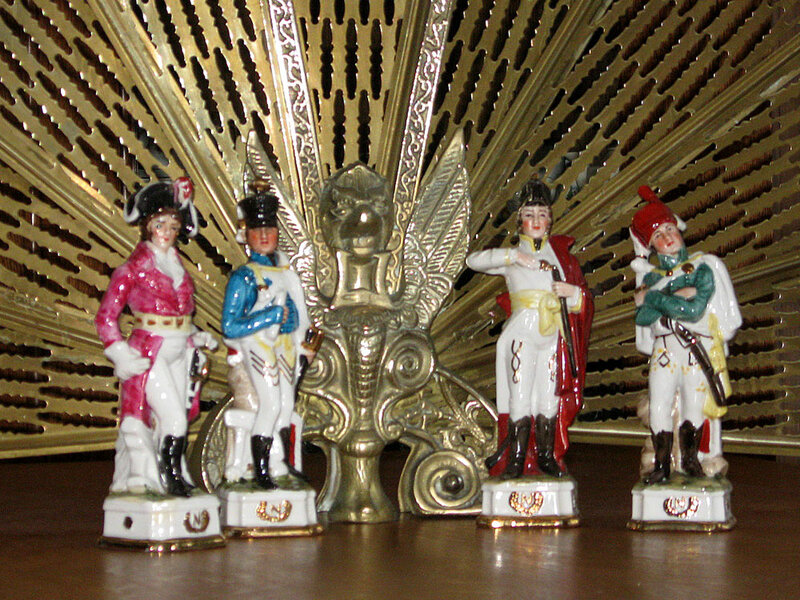 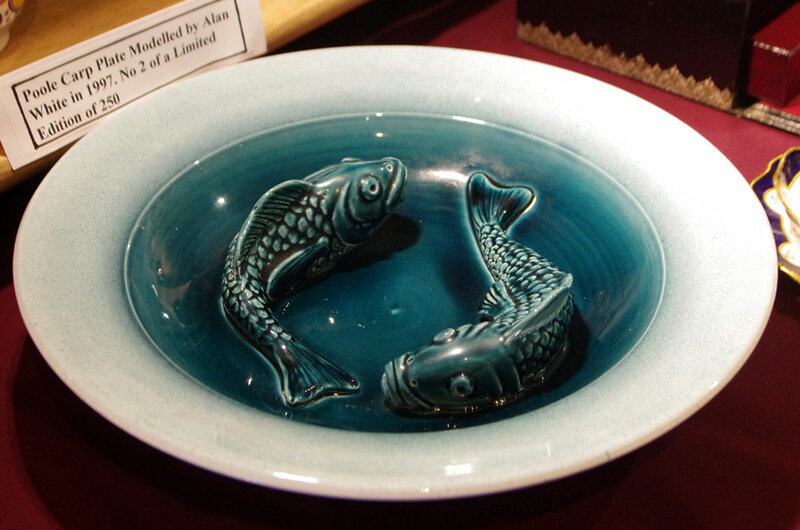 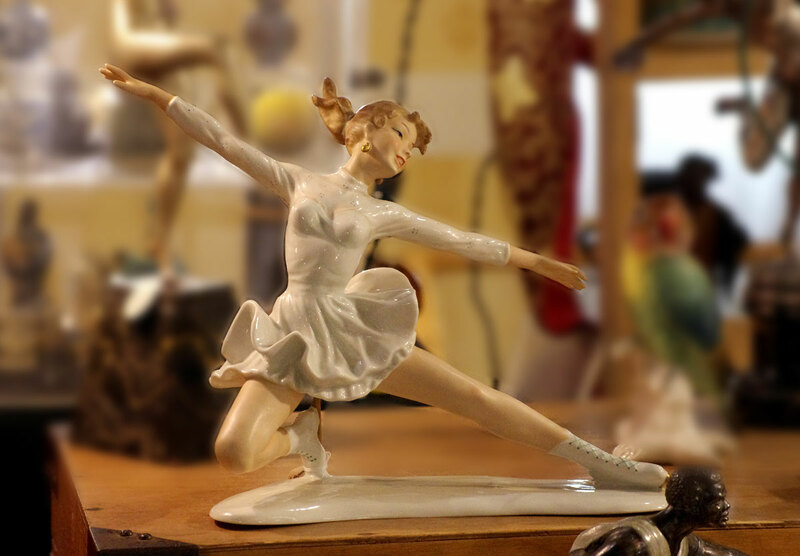 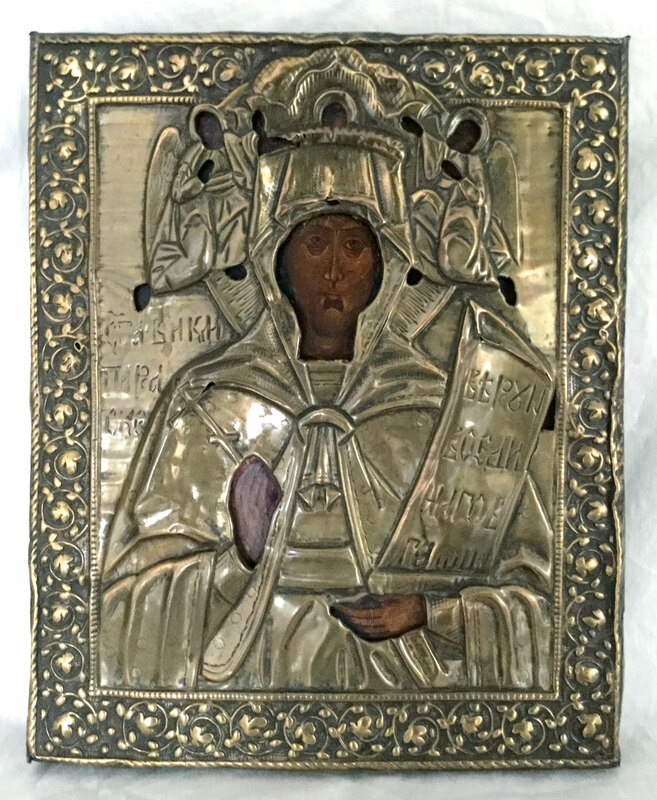 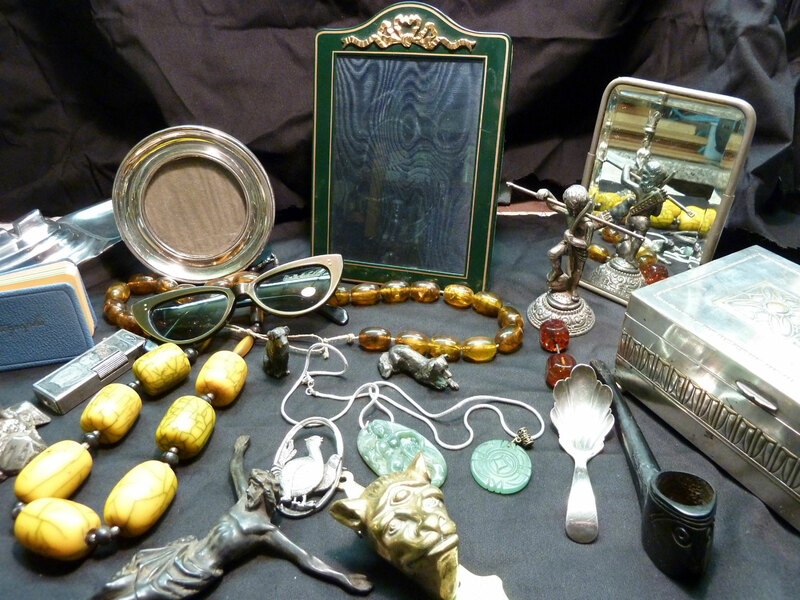 Edwin's eclectic mix includes silverware, ceramics, glasswares, painting & prints, examples of Victorian and Edwardian woodenwork, cut glass and bronze & spelter figures. 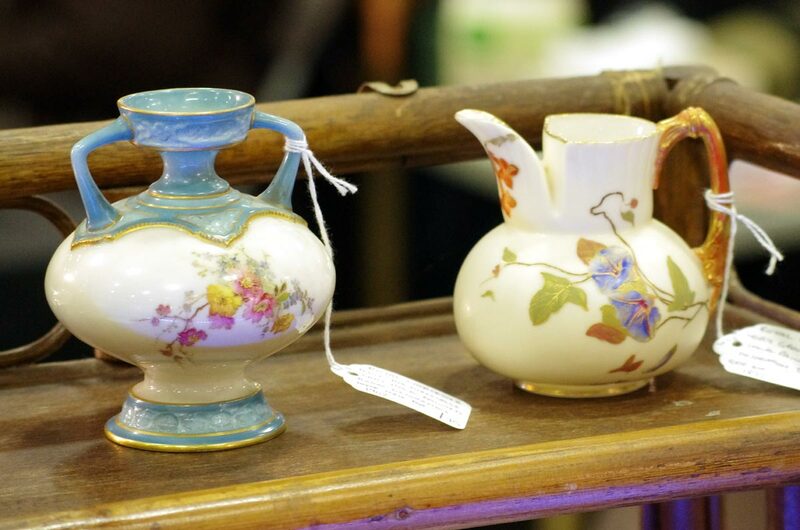 If you would like to see who took part in the previous Antiques @ The Holt fair in November 2018, please follow this link: Dealers November 2018.